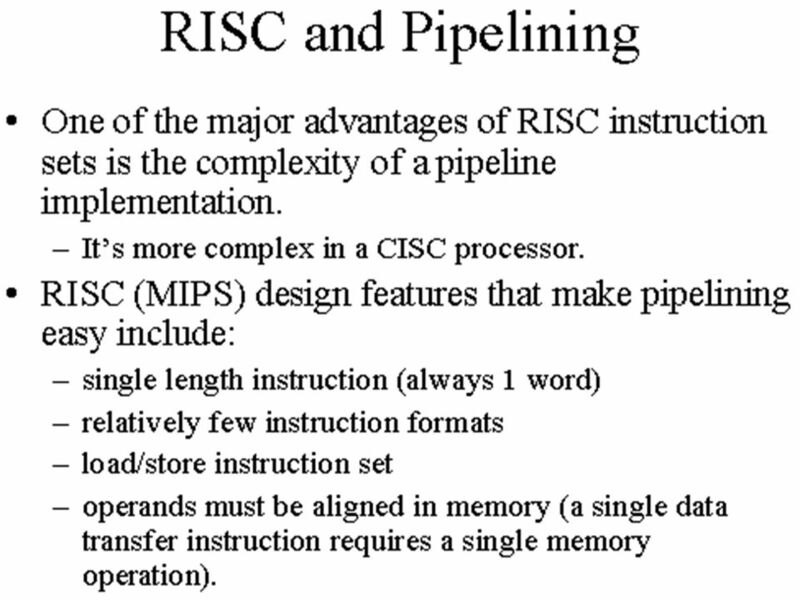 RISC and Pipelining Prof. Sin-Min Lee Department of Computer Science. 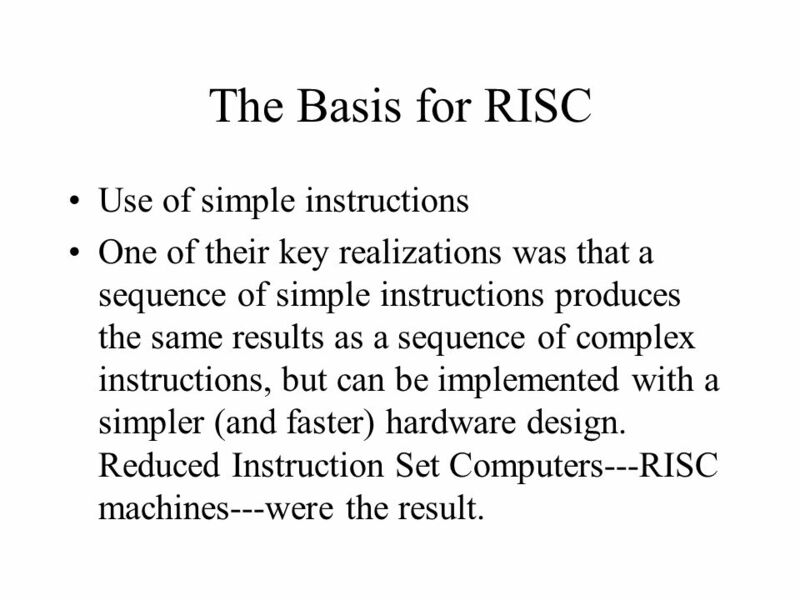 2 The Basis for RISC Use of simple instructions One of their key realizations was that a sequence of simple instructions produces the same results as a sequence of complex instructions, but can be implemented with a simpler (and faster) hardware design. 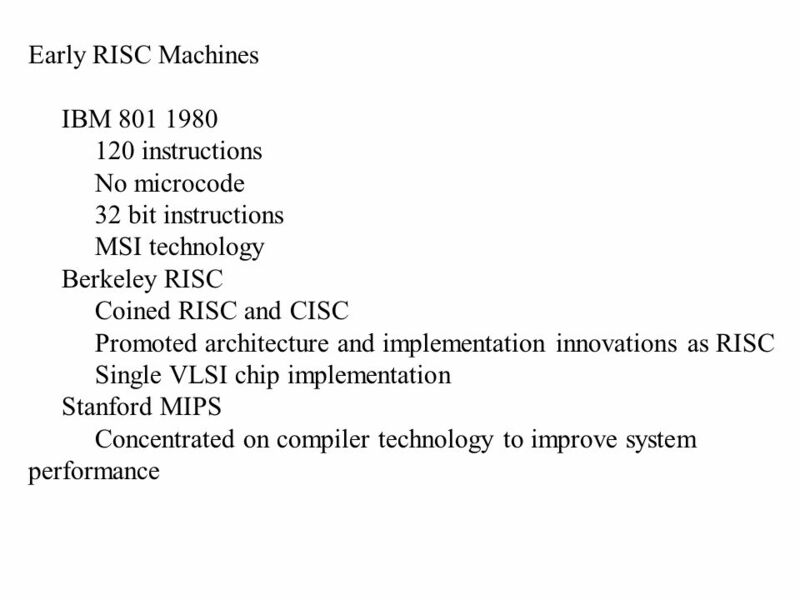 Reduced Instruction Set Computers---RISC machines---were the result. 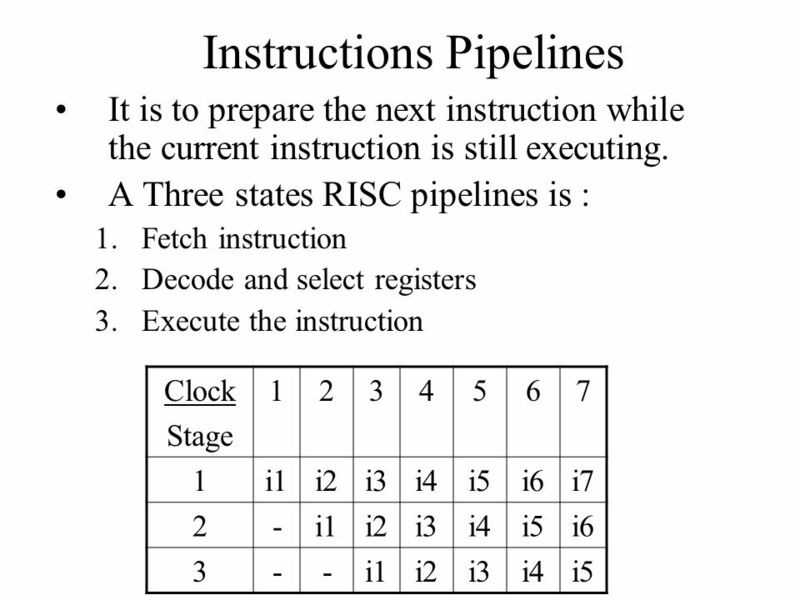 3 RISC characteristics Simple instruction set. 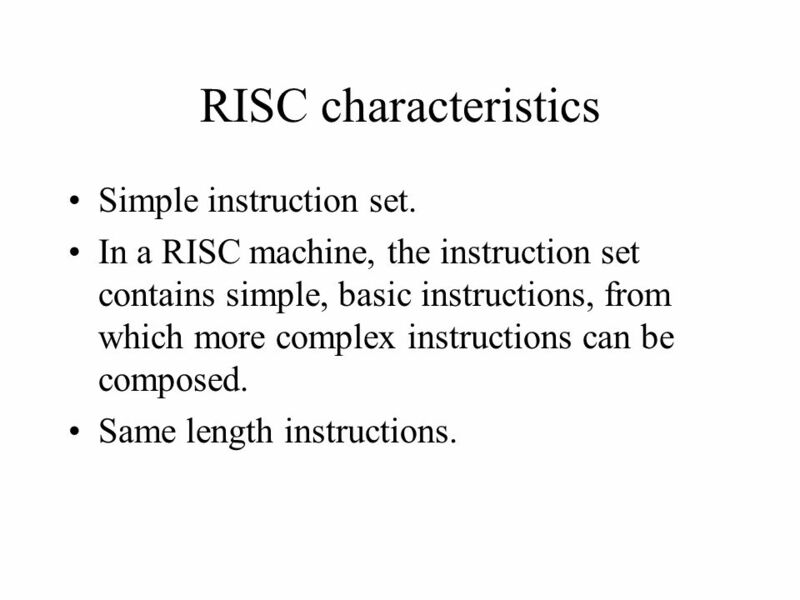 In a RISC machine, the instruction set contains simple, basic instructions, from which more complex instructions can be composed. Same length instructions. 8 Each instruction is the same length, so that it may be fetched in a single operation. 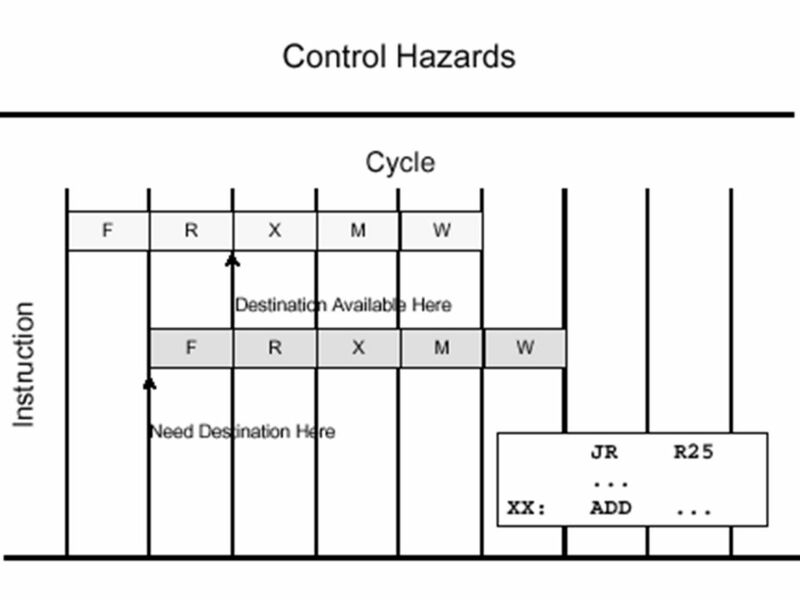 1 machine-cycle instructions. 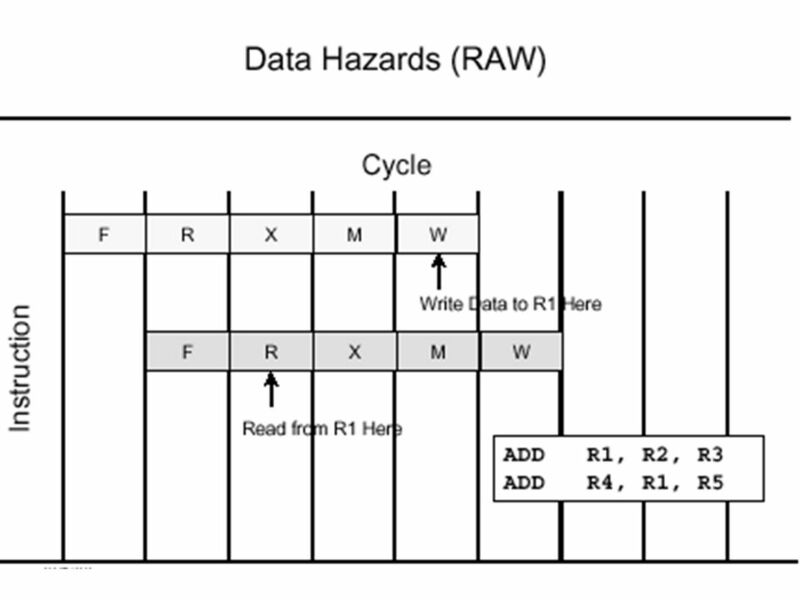 Most instructions complete in one machine cycle, which allows the processor to handle several instructions at the same time. 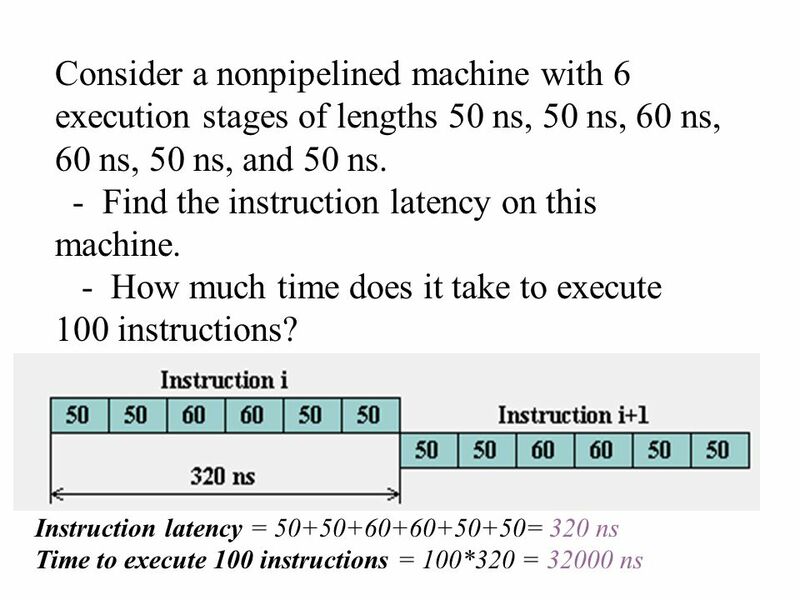 This pipelining is a key technique used to speed up RISC machines. 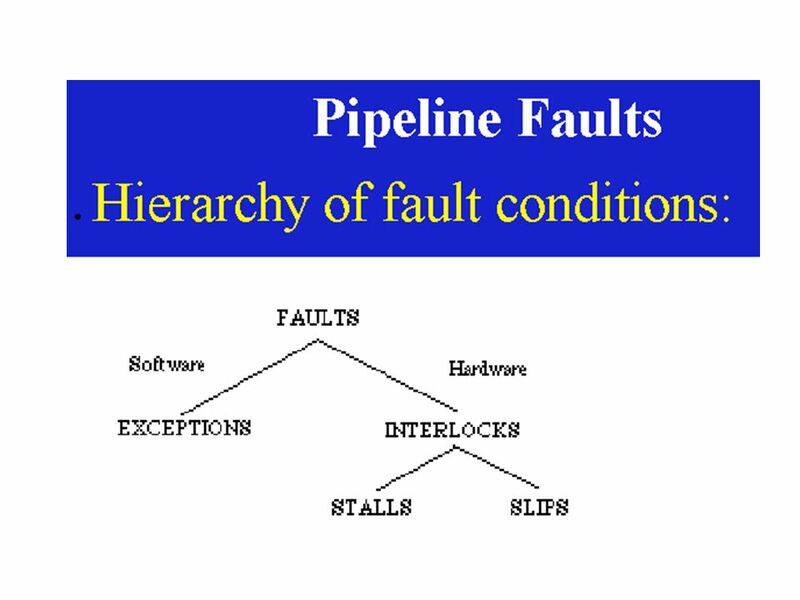 10 Instruction Pipelines Conflicts It divided into two categories. 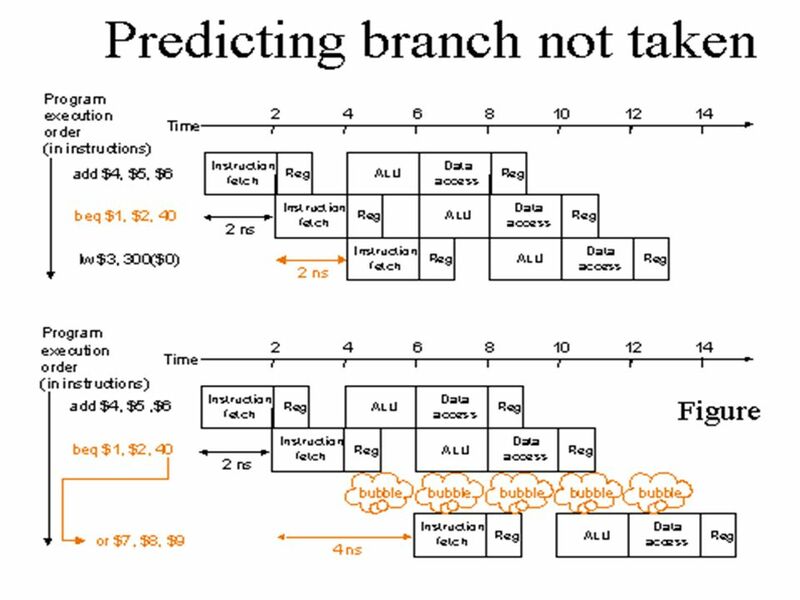 –Data Conflicts –Branch Conflicts When the current instruction changes a register that the next one needed, data conflicts happens. 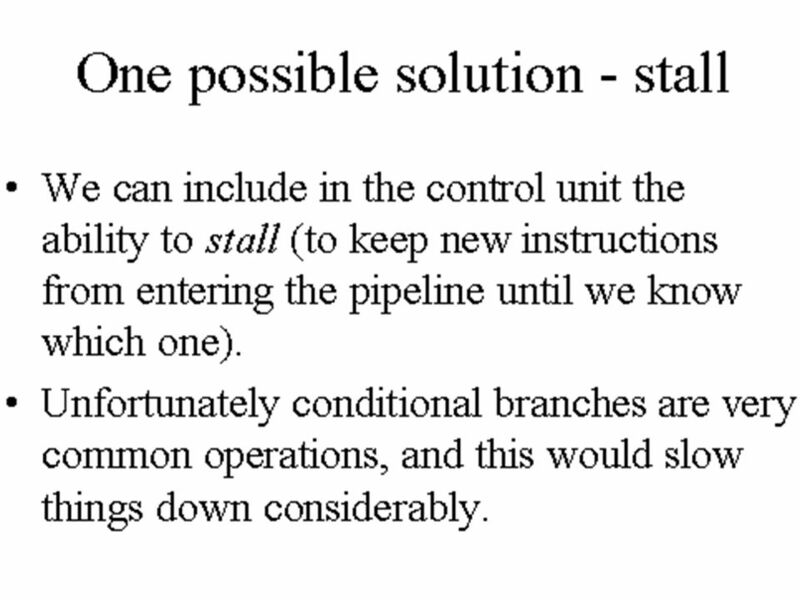 When the current instruction make a jump, branch conflicts happens. 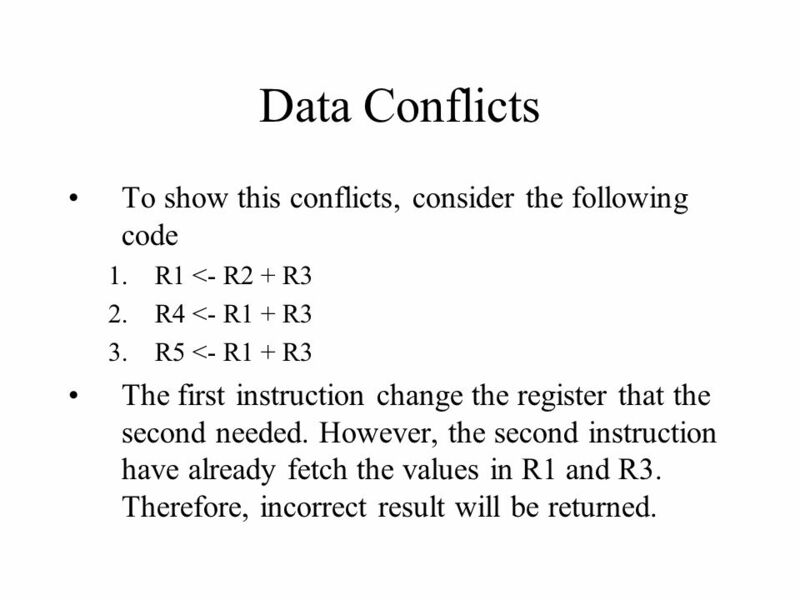 11 Data Conflicts To show this conflicts, consider the following code 1.R1 <- R2 + R3 2.R4 <- R1 + R3 3.R5 <- R1 + R3 The first instruction change the register that the second needed. 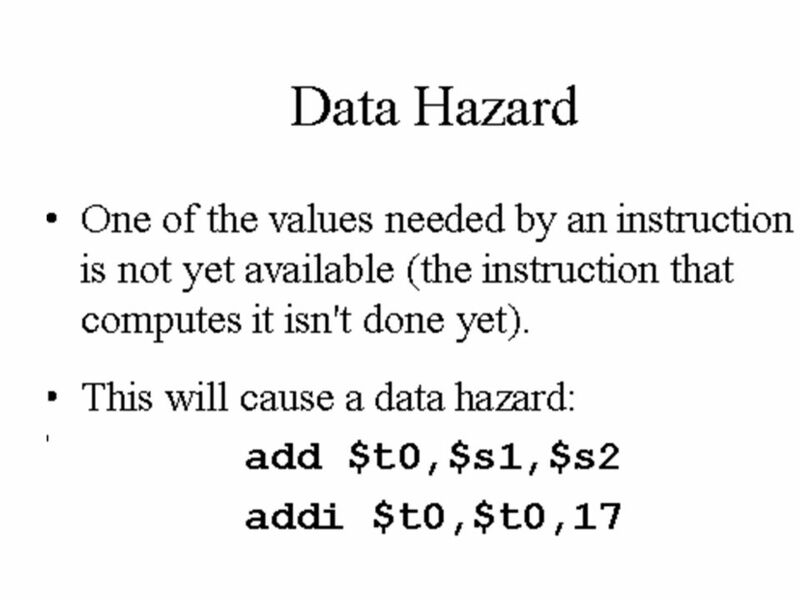 However, the second instruction have already fetch the values in R1 and R3. Therefore, incorrect result will be returned. 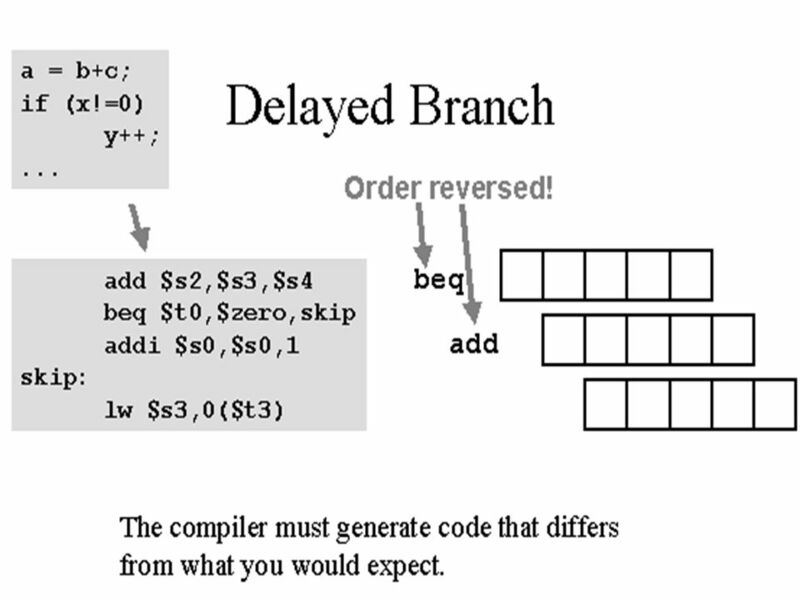 13 Branch Conflicts Consider the code: 1.R1 <- R2 + R3 2.R4 <- R5 + R6 3.JUMP 10 4.R7 <- R8 +R9. 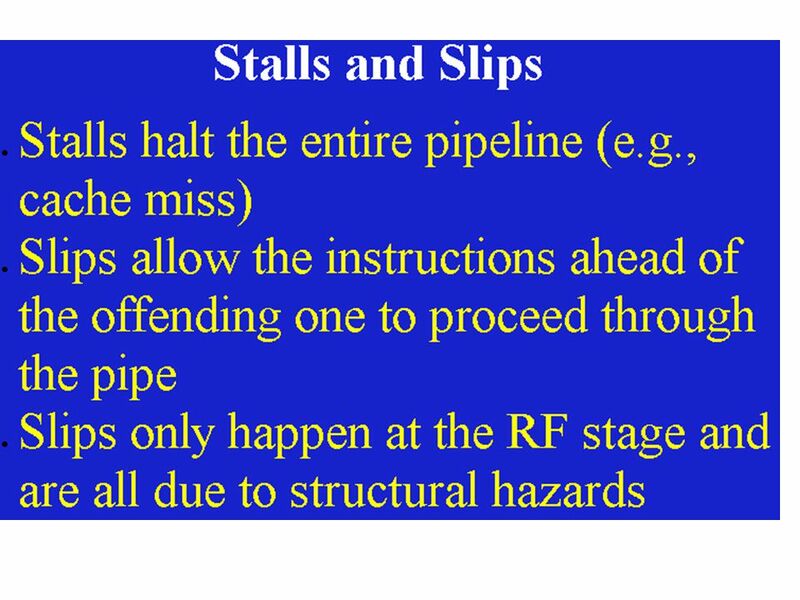 10.R13 <- R14 + R15 The codes 4 and 5 have been fetched before the jump made so illegal changes may made. 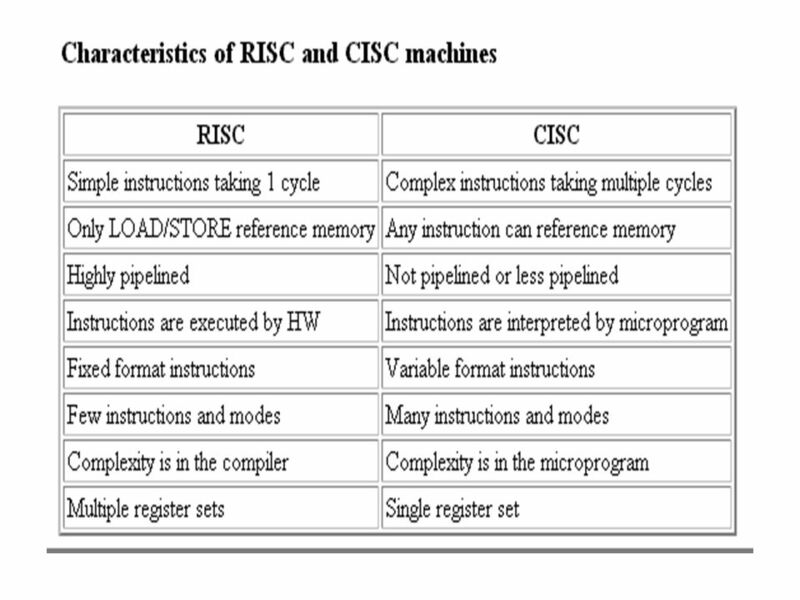 15 RISC vs. CISC RISC have fewer and simpler instructions, therefore, they are less complex and easier to design. 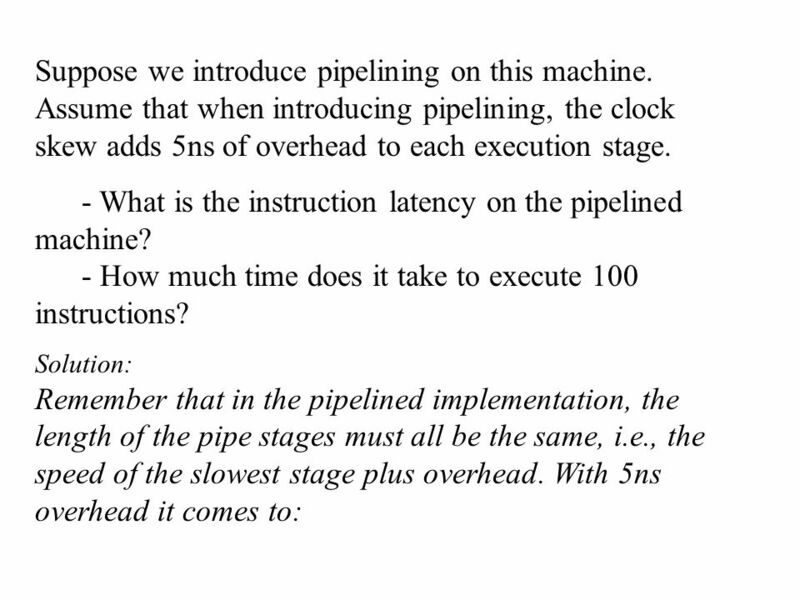 Also, it allow higher clock speed than CISC. 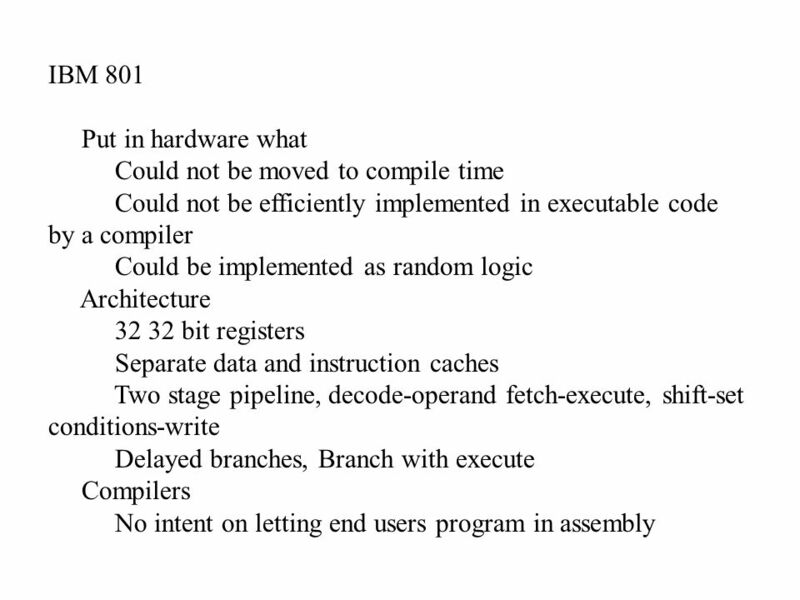 However, When we compiled high-level language. 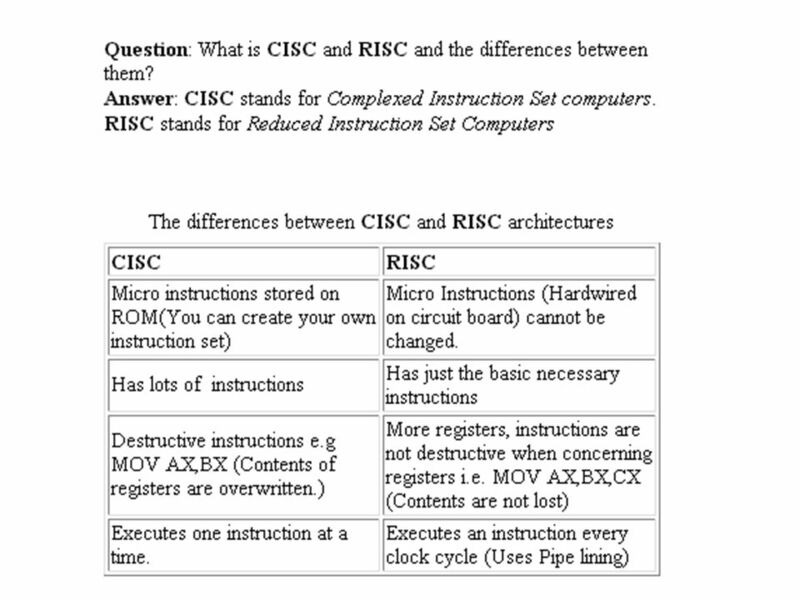 RISC CPU need more instructions than CISC CPU. CISC are complex but it doesn’t necessarily increase the cost. 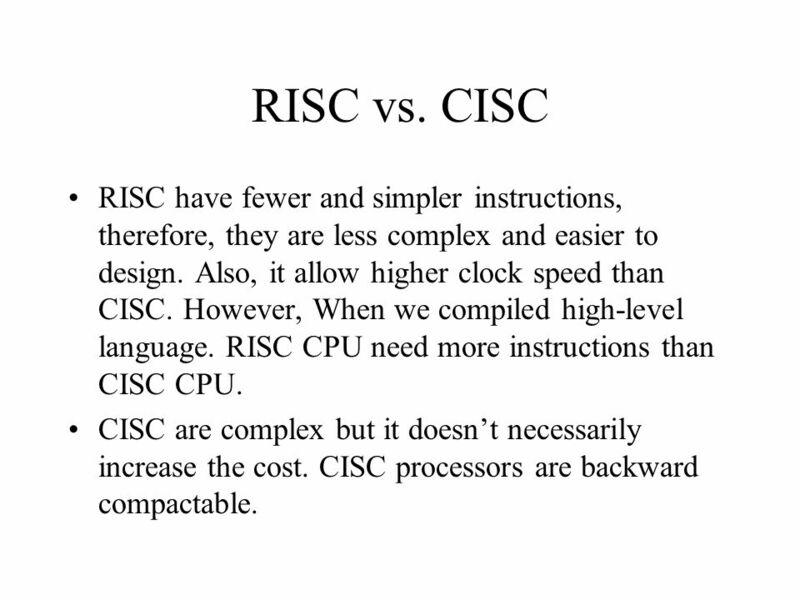 CISC processors are backward compactable. 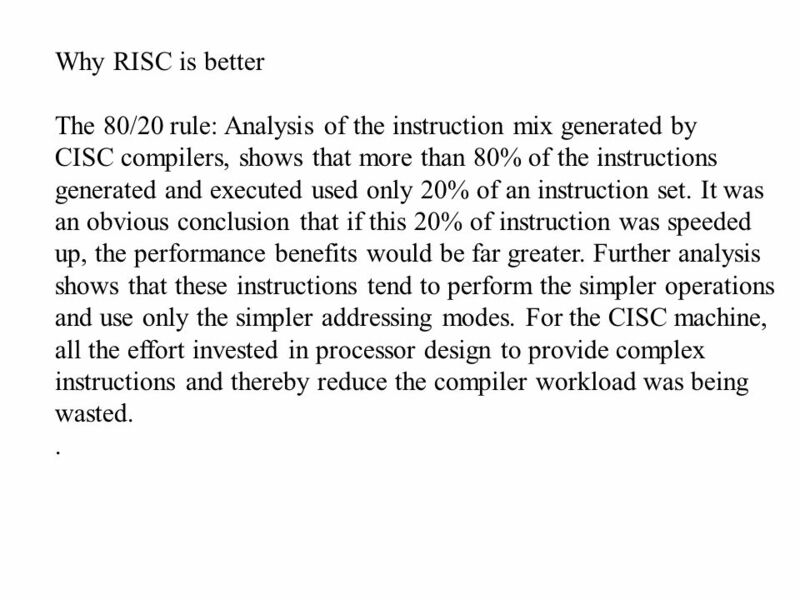 16 Why RISC is better The 80/20 rule: Analysis of the instruction mix generated by CISC compilers, shows that more than 80% of the instructions generated and executed used only 20% of an instruction set. 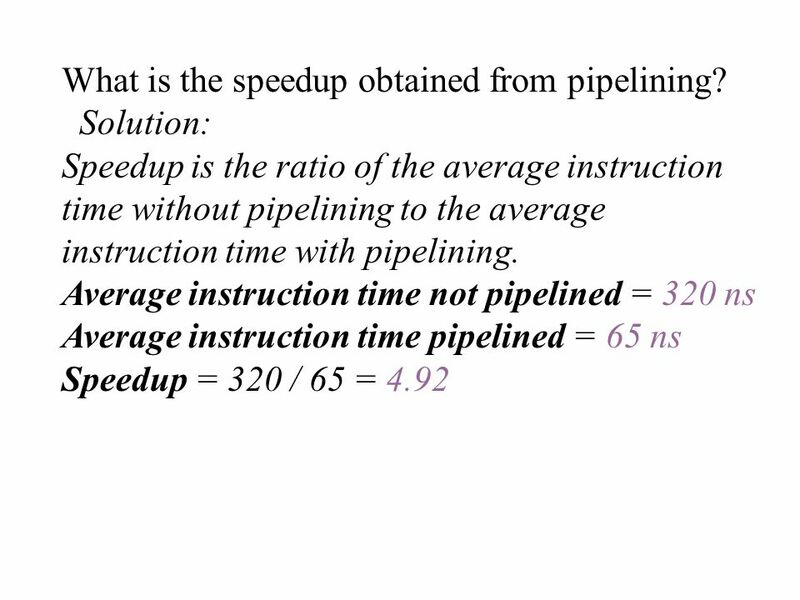 It was an obvious conclusion that if this 20% of instruction was speeded up, the performance benefits would be far greater. 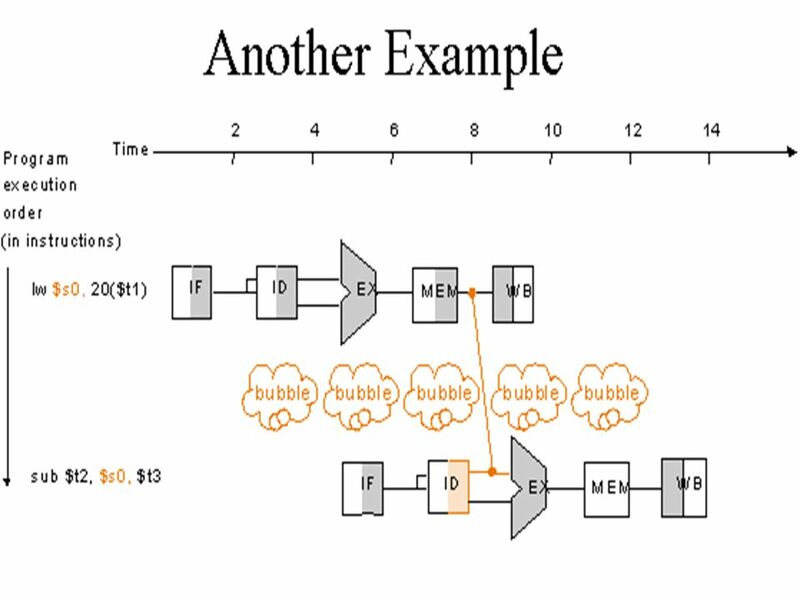 Further analysis shows that these instructions tend to perform the simpler operations and use only the simpler addressing modes. 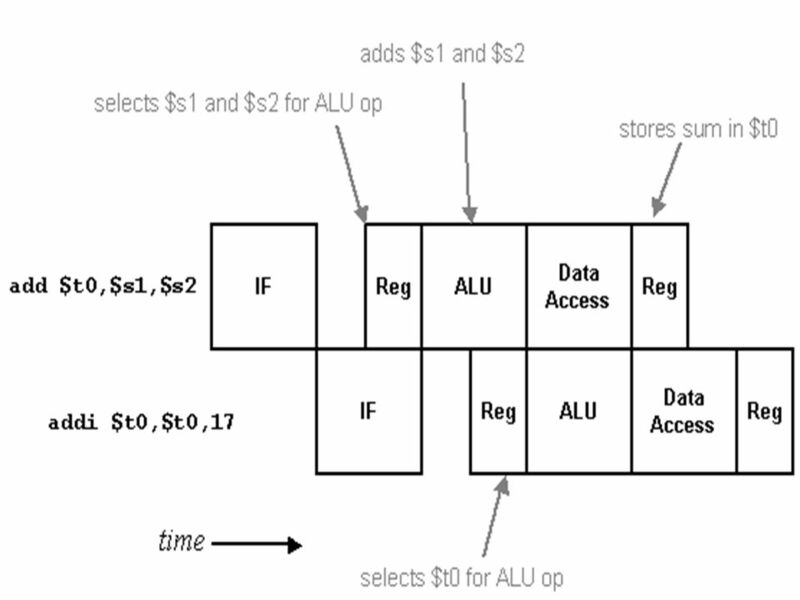 For the CISC machine, all the effort invested in processor design to provide complex instructions and thereby reduce the compiler workload was being wasted..
17 Less cost: Since only the simpler instructions are needed, the processor hardware required to implement them could be reduced in complexity. 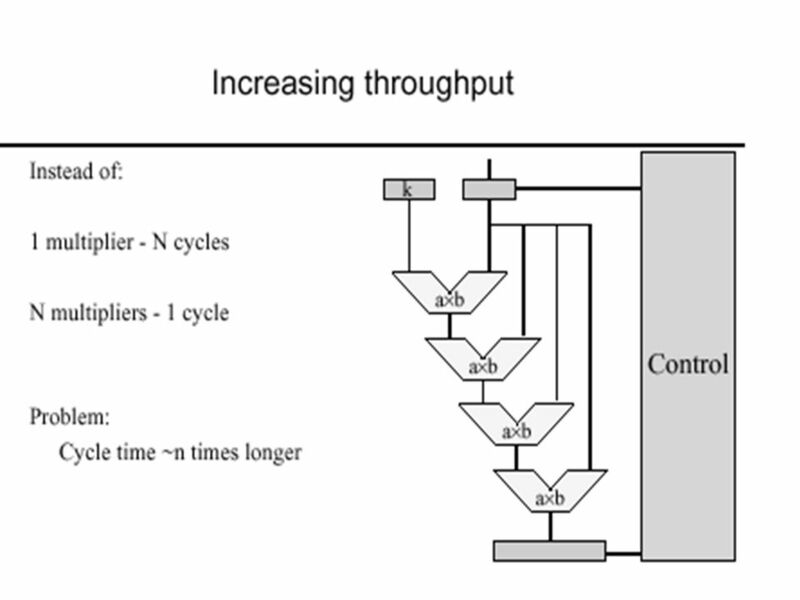 Therefor it should be possible to design a more performance processor with less cost. 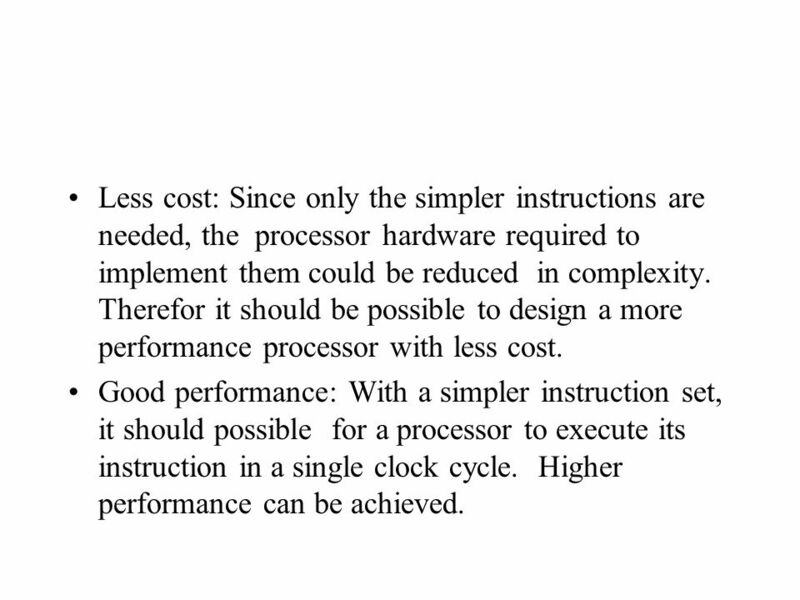 Good performance: With a simpler instruction set, it should possible for a processor to execute its instruction in a single clock cycle. 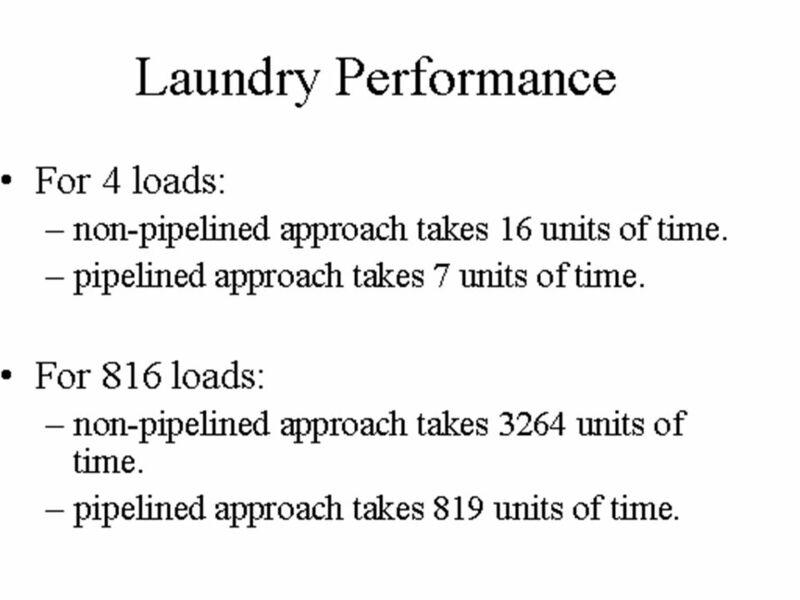 Higher performance can be achieved. 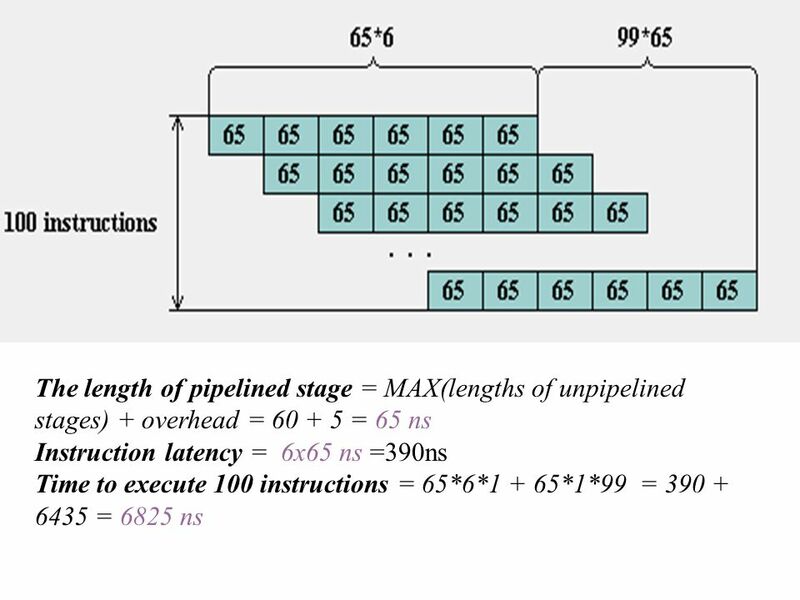 18 Pipelining: A key RISC technique RISC designers are concerned primarily with creating the fastest chip possible, and so they use a number of techniques, including pipelining. 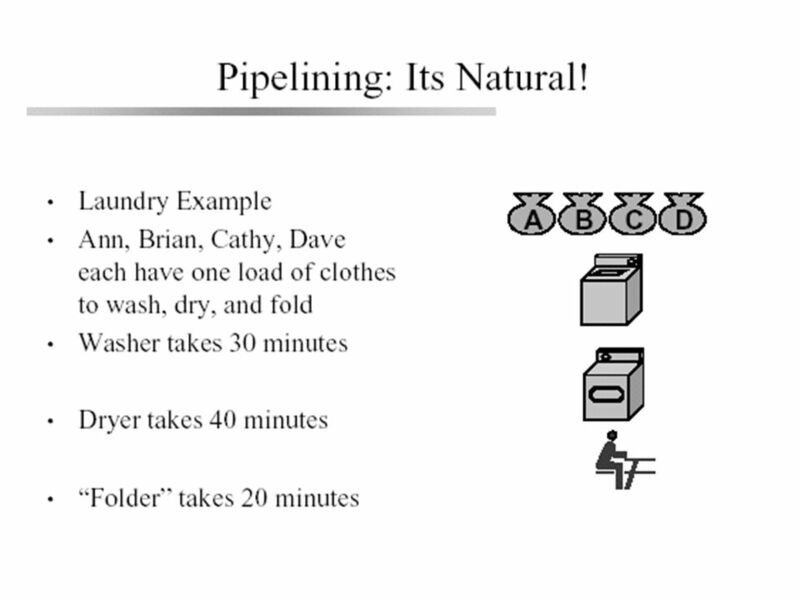 Pipelining is a design technique where the computer's hardware processes more than one instruction at a time, and doesn't wait for one instruction to complete before starting the next. 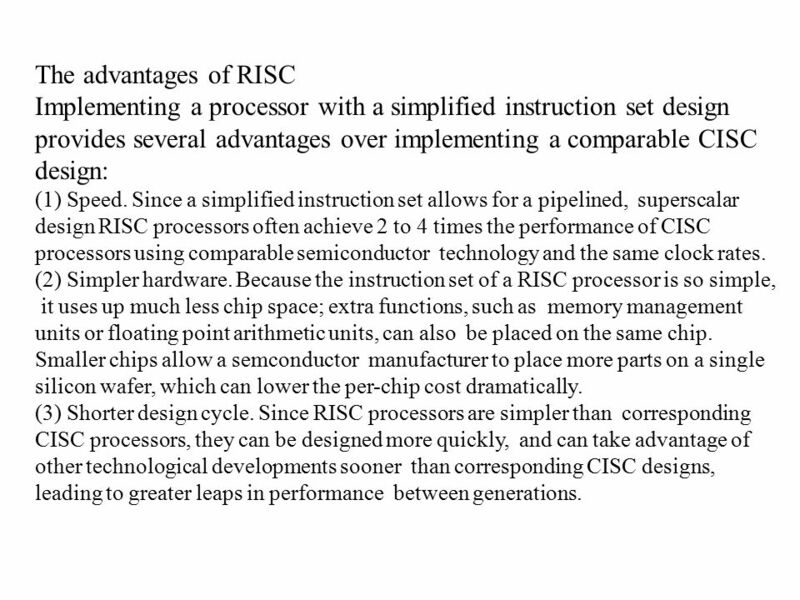 19 The advantages of RISC Implementing a processor with a simplified instruction set design provides several advantages over implementing a comparable CISC design: (1) Speed. 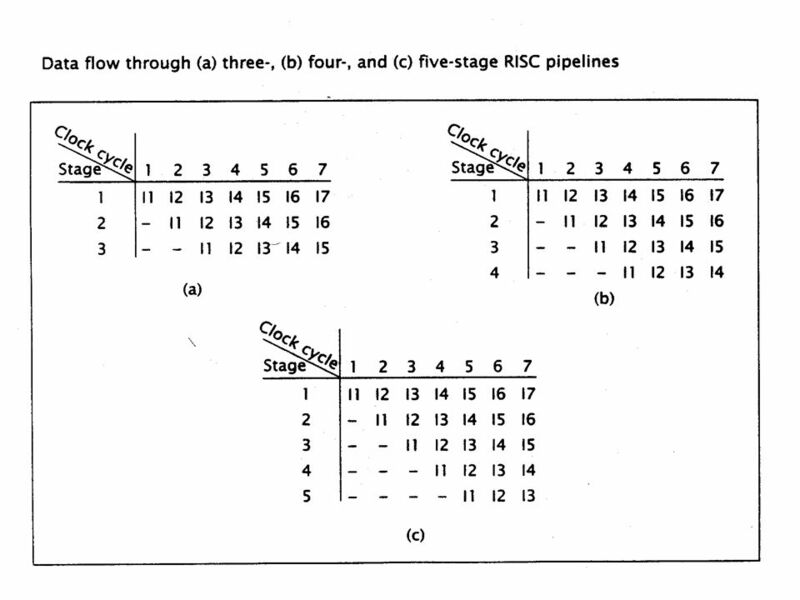 Since a simplified instruction set allows for a pipelined, superscalar design RISC processors often achieve 2 to 4 times the performance of CISC processors using comparable semiconductor technology and the same clock rates. 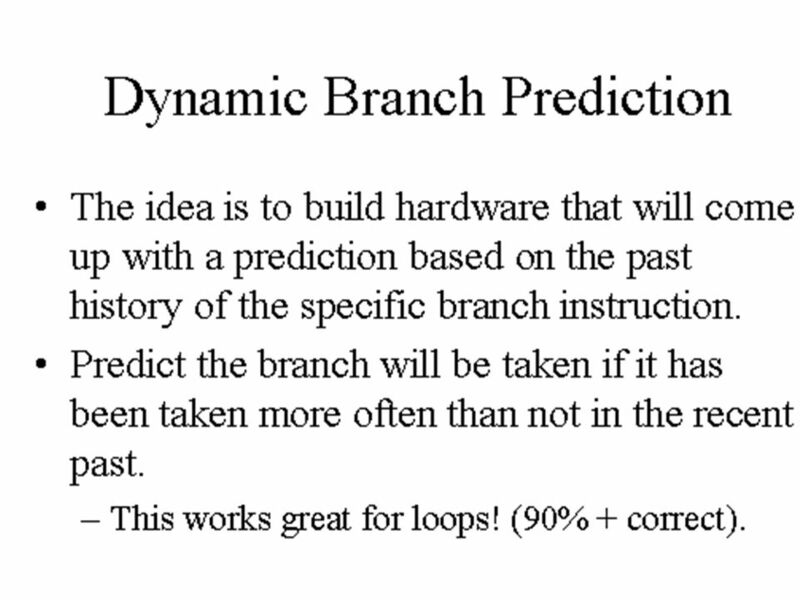 (2) Simpler hardware. 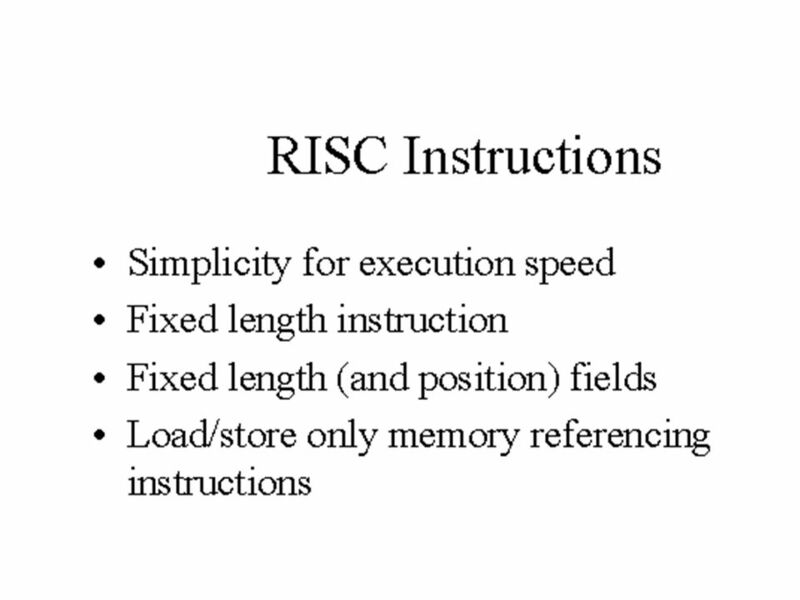 Because the instruction set of a RISC processor is so simple, it uses up much less chip space; extra functions, such as memory management units or floating point arithmetic units, can also be placed on the same chip. Smaller chips allow a semconductor manufacturer to place more parts on a single silicon wafer, which can lower the per-chip cost dramatically. (3) Shorter design cycle. 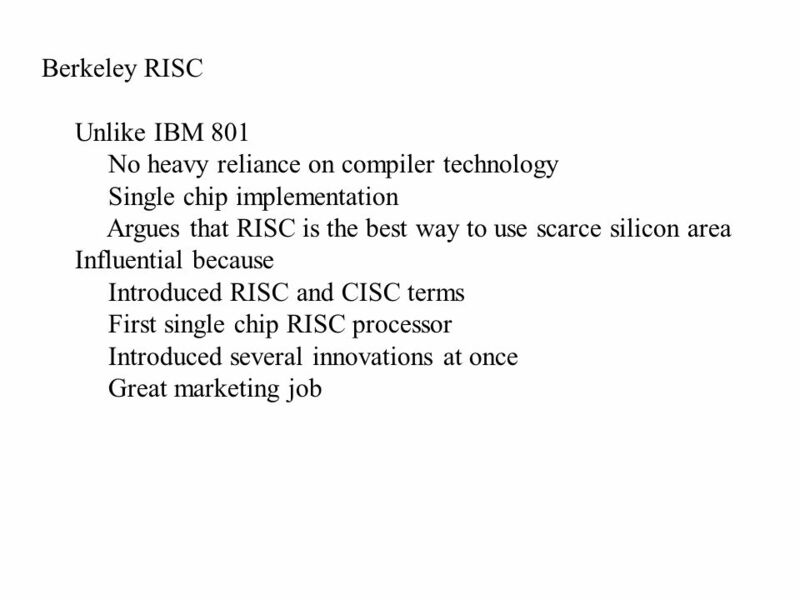 Since RISC processors are simpler than corresponding CISC processors, they can be designed more quickly, and can take advantage of other technological developments sooner than corresponding CISC designs, leading to greater leaps in performance between generations. 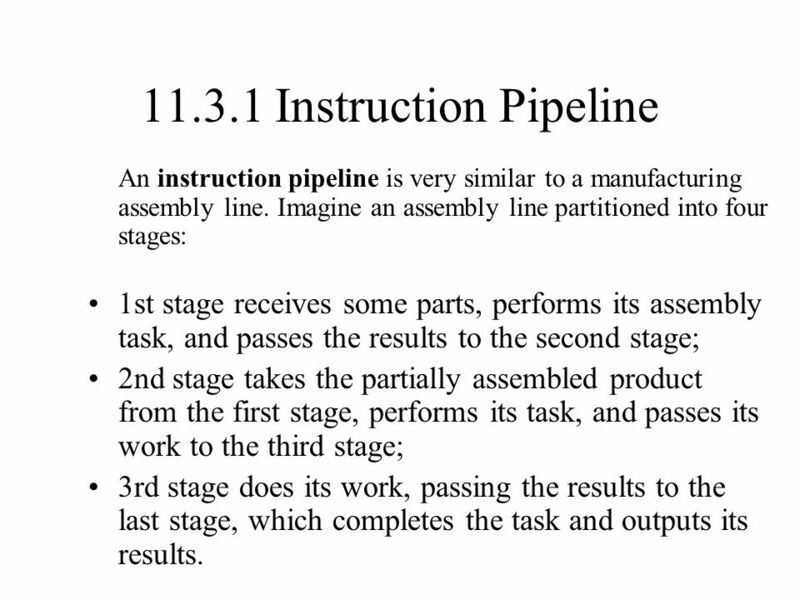 34 11.3.1 Instruction Pipeline An instruction pipeline is very similar to a manufacturing assembly line. 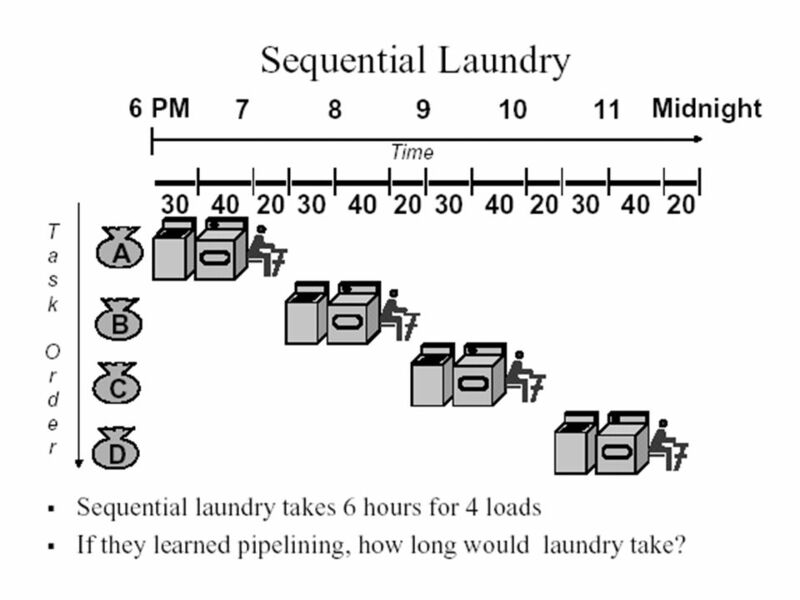 Imagine an assembly line partitioned into four stages: 1st stage receives some parts, performs its assembly task, and passes the results to the second stage; 2nd stage takes the partially assembled product from the first stage, performs its task, and passes its work to the third stage; 3rd stage does its work, passing the results to the last stage, which completes the task and outputs its results. 35 As the first piece moves from the first stage to the second stage, a new set of parts for a new piece enters the first stage. 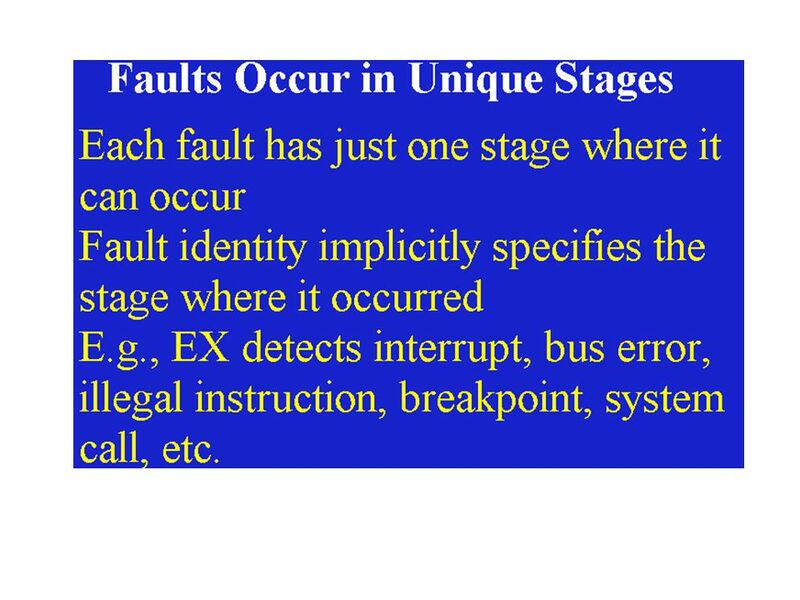 Ultimately, every stage processes a piece simultaneously. This is how time is saved. 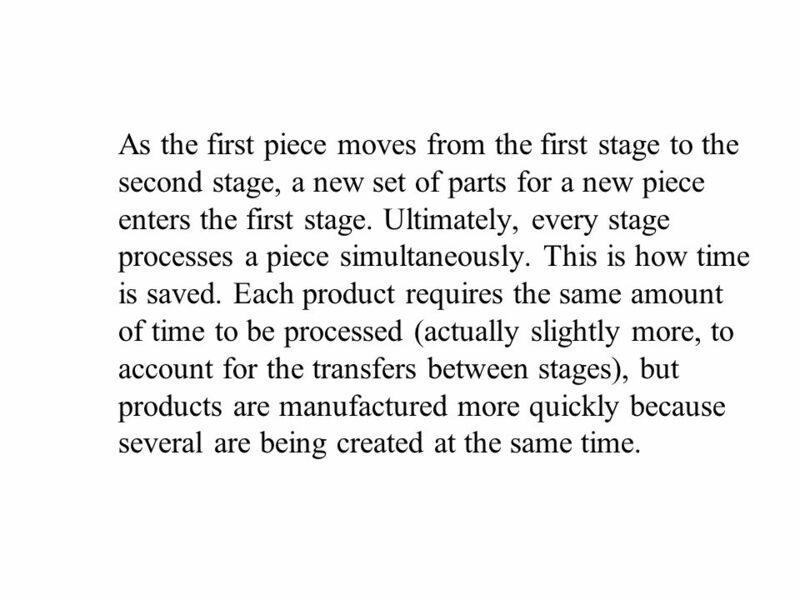 Each product requires the same amount of time to be processed (actually slightly more, to account for the transfers between stages), but products are manufactured more quickly because several are being created at the same time. 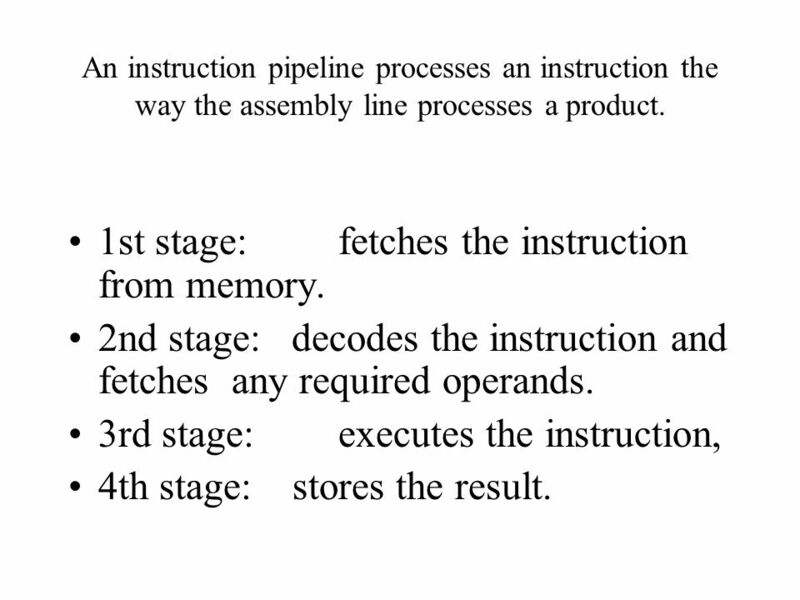 36 An instruction pipeline processes an instruction the way the assembly line processes a product. 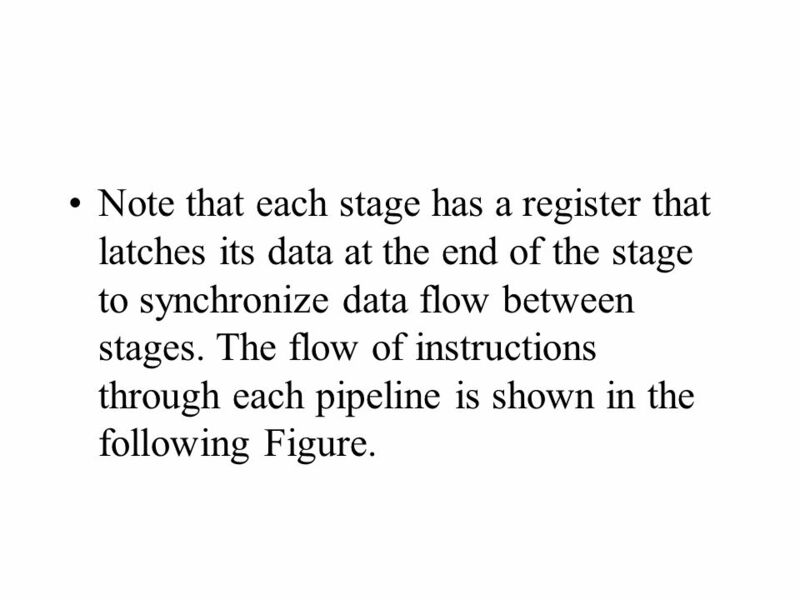 1st stage: fetches the instruction from memory. 2nd stage: decodes the instruction and fetches any required operands. 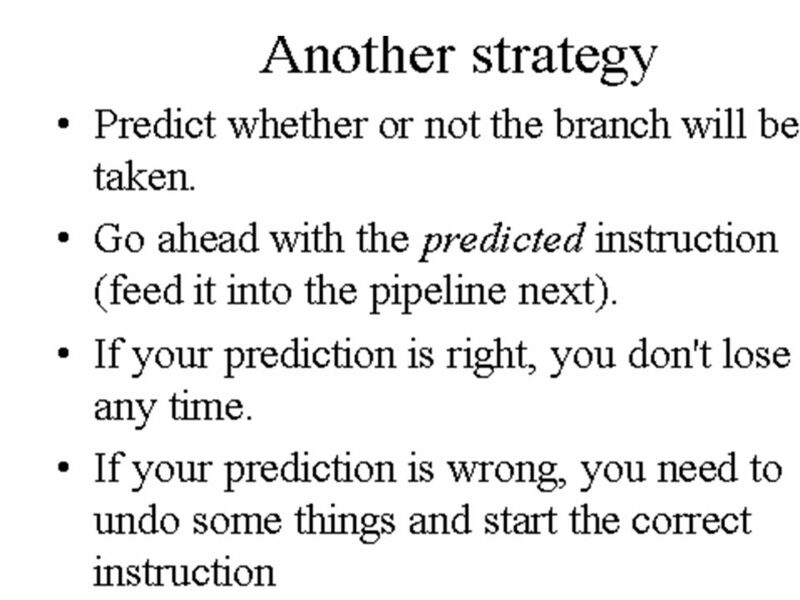 3rd stage: executes the instruction, 4th stage: stores the result. 42 Each instruction is the same length, so that it may be fetched in a single operation. 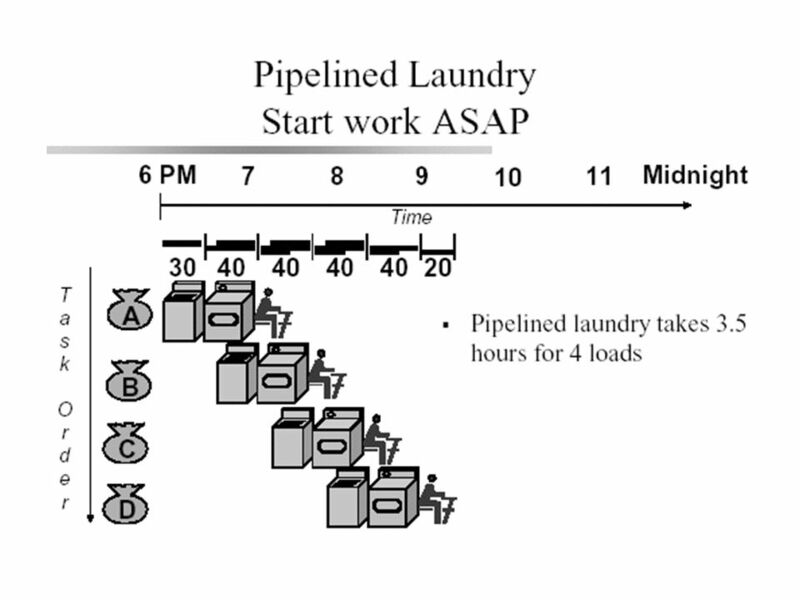 1 machine-cycle instructions. 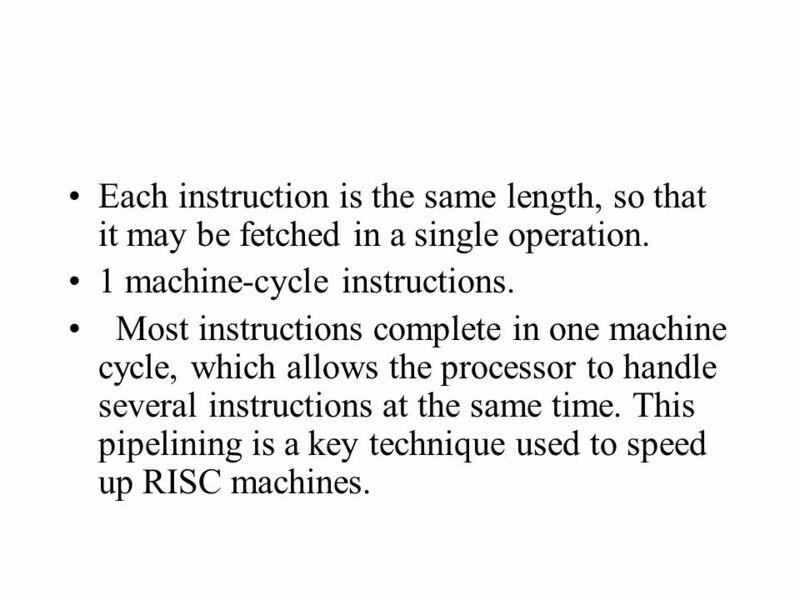 Most instructions complete in one machine cycle, which allows the processor to handle several instructions at the same time. 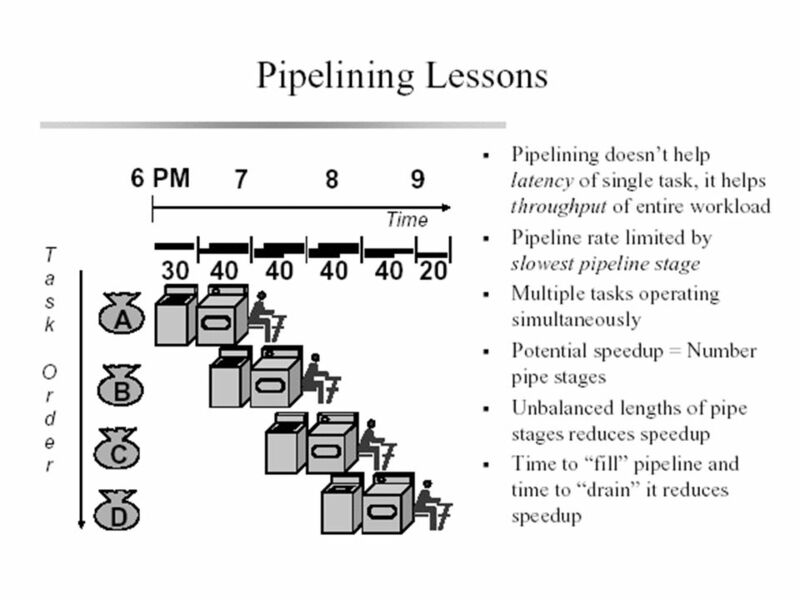 This pipelining is a key technique used to speed up RISC machines. 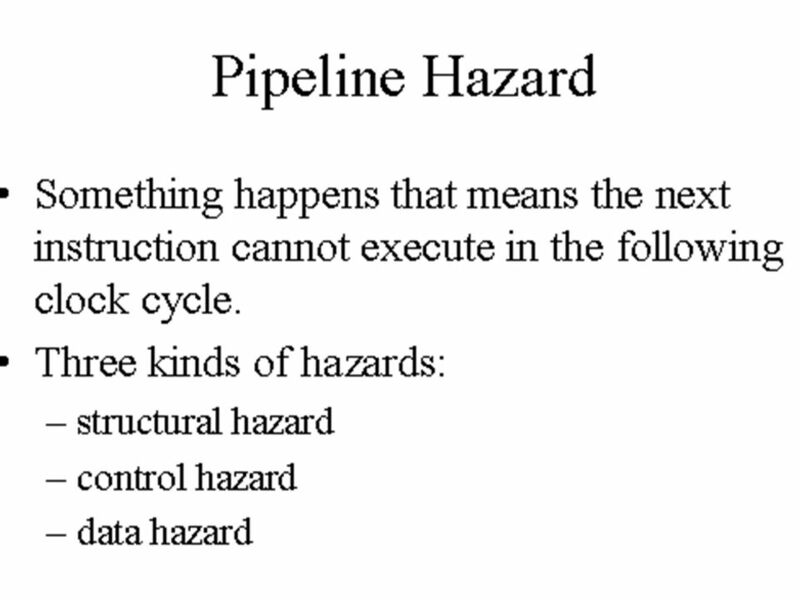 58 Instruction Pipelines Conflicts It divided into two categories. 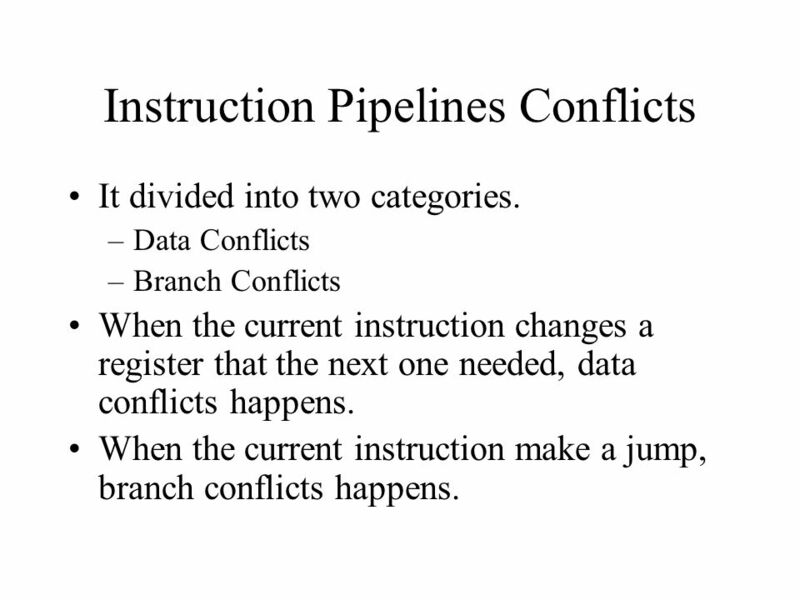 –Data Conflicts –Branch Conflicts When the current instruction changes a register that the next one needed, data conflicts happens. 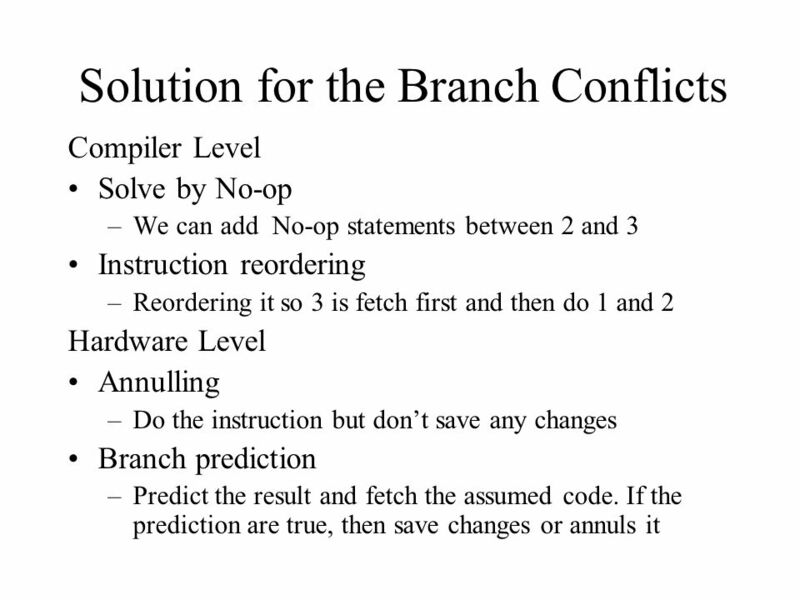 When the current instruction make a jump, branch conflicts happens. 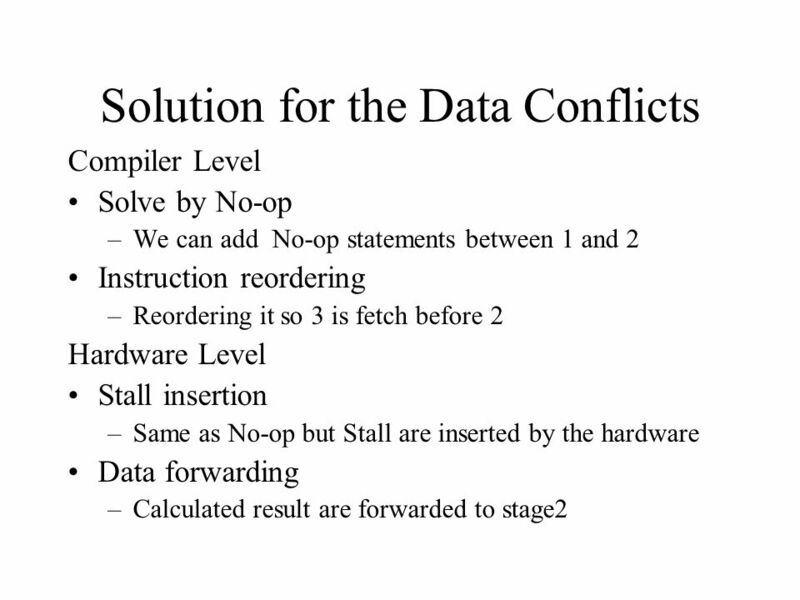 59 Data Conflicts To show this conflicts, consider the following code 1.R1 <- R2 + R3 2.R4 <- R1 + R3 3.R5 <- R1 + R3 The first instruction change the register that the second needed. 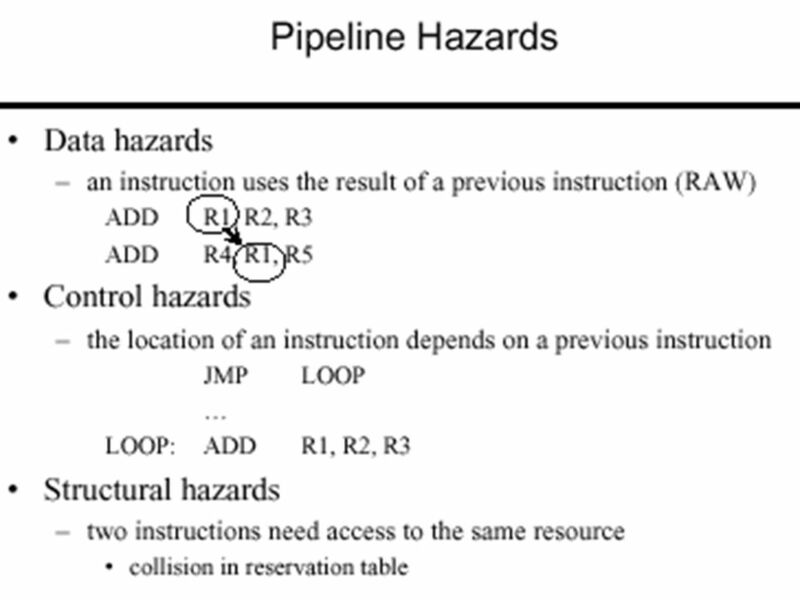 However, the second instruction have already fetch the values in R1 and R3. Therefore, incorrect result will be returned. 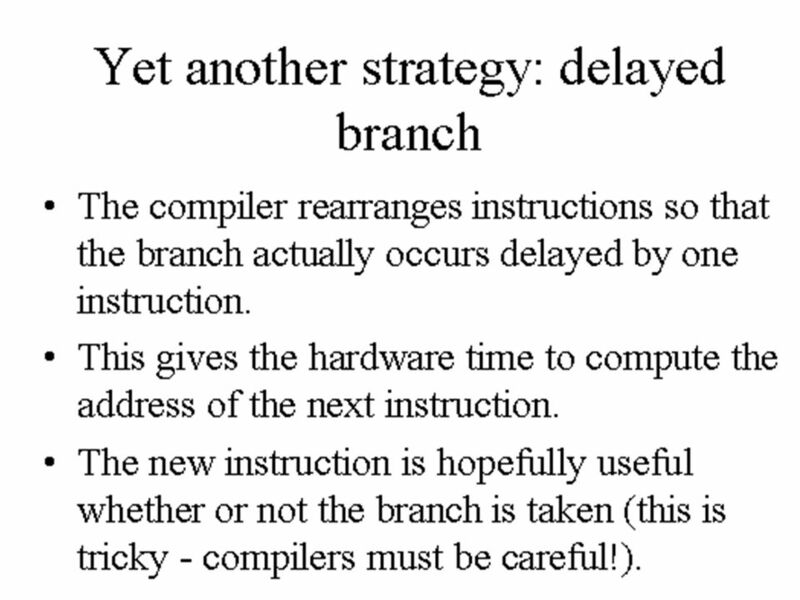 61 Branch Conflicts Consider the code: 1.R1 <- R2 + R3 2.R4 <- R5 + R6 3.JUMP 10 4.R7 <- R8 +R9. 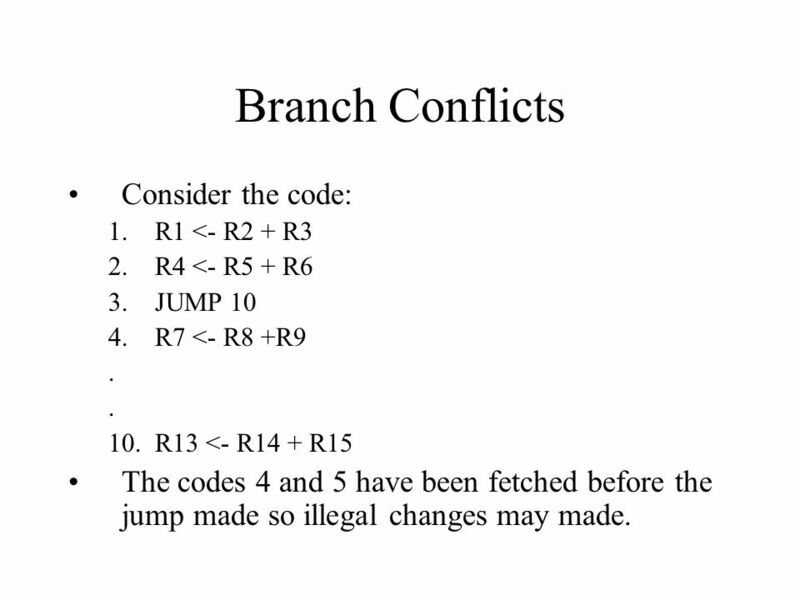 10.R13 <- R14 + R15 The codes 4 and 5 have been fetched before the jump made so illegal changes may made. 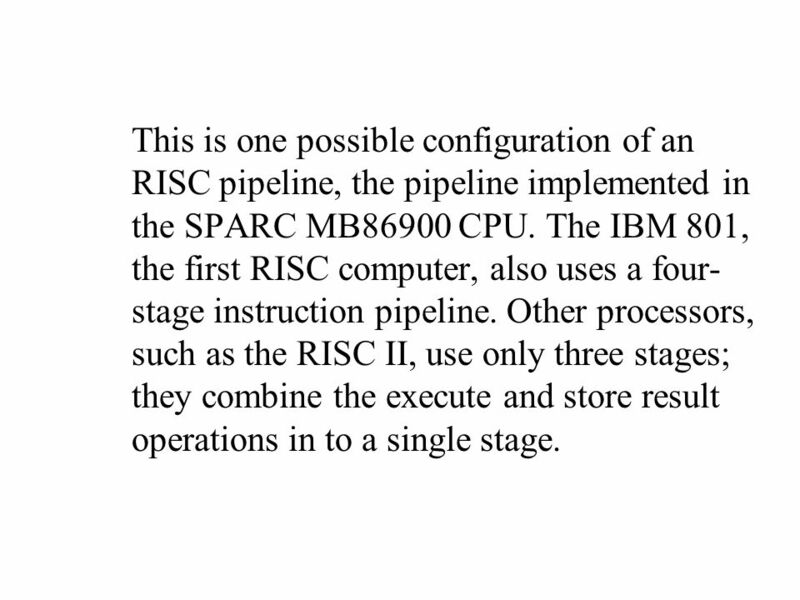 76 This is one possible configuration of an RISC pipeline, the pipeline implemented in the SPARC MB86900 CPU. 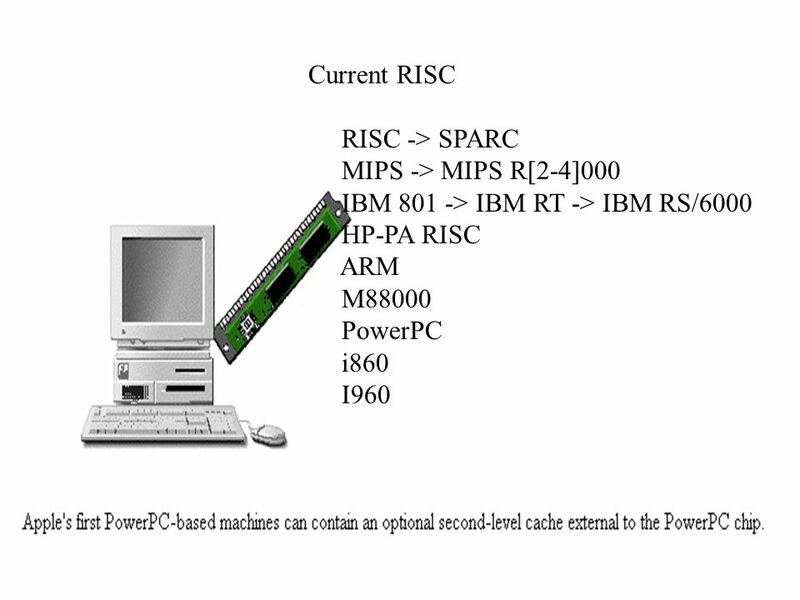 The IBM 801, the first RISC computer, also uses a four- stage instruction pipeline. 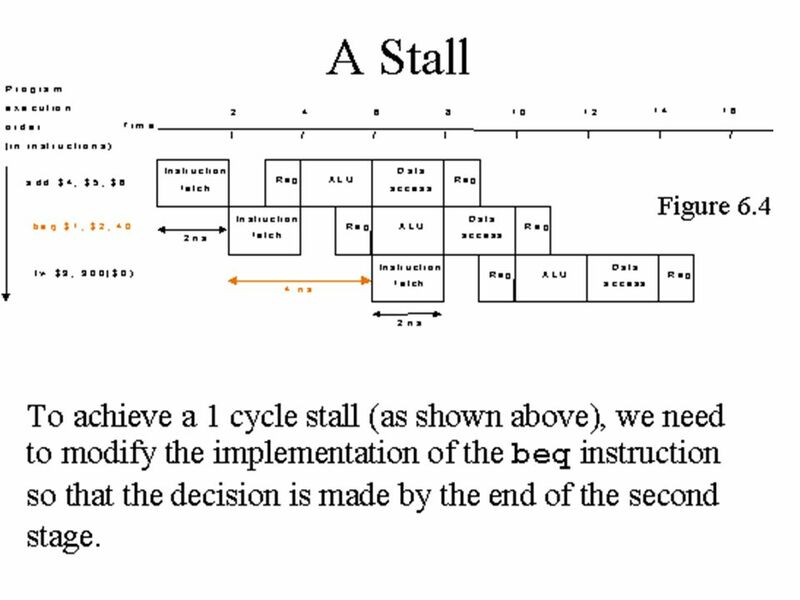 Other processors, such as the RISC II, use only three stages; they combine the execute and store result operations in to a single stage. 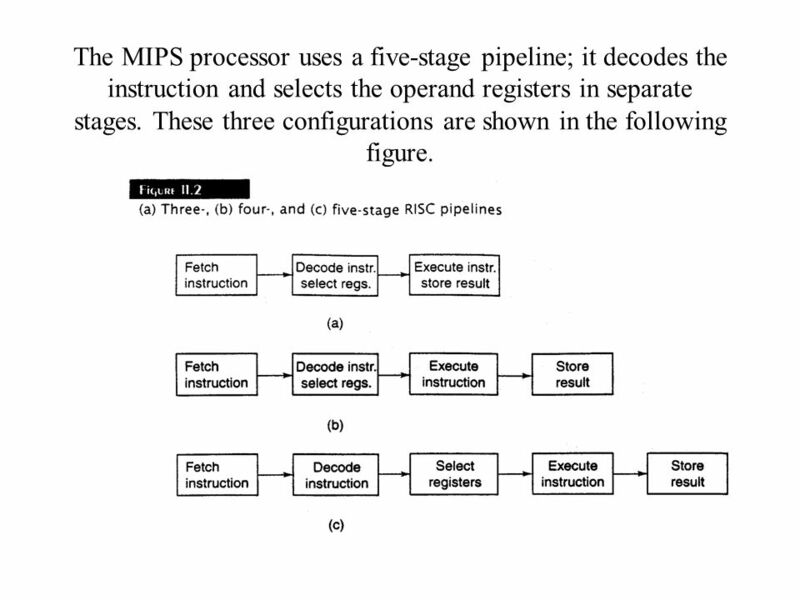 77 The MIPS processor uses a five-stage pipeline; it decodes the instruction and selects the operand registers in separate stages. These three configurations are shown in the following figure. 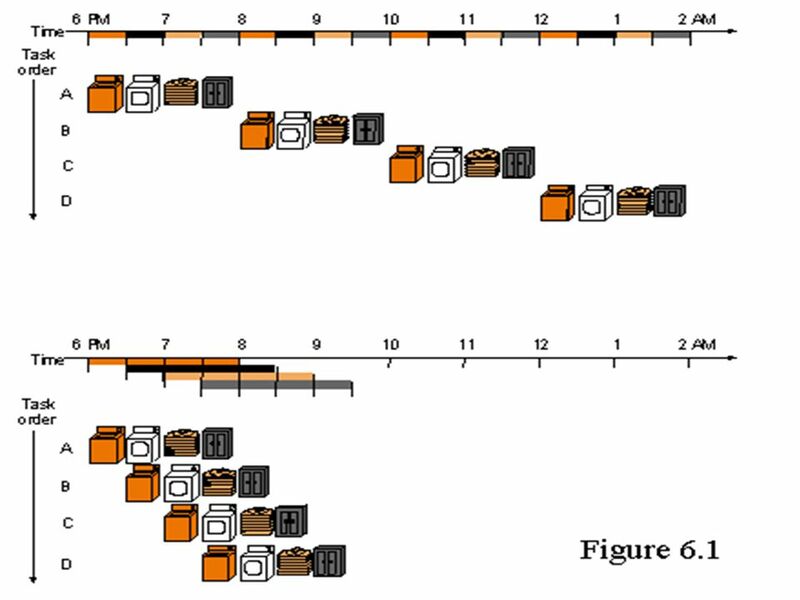 78 Note that each stage has a register that latches its data at the end of the stage to synchronize data flow between stages. 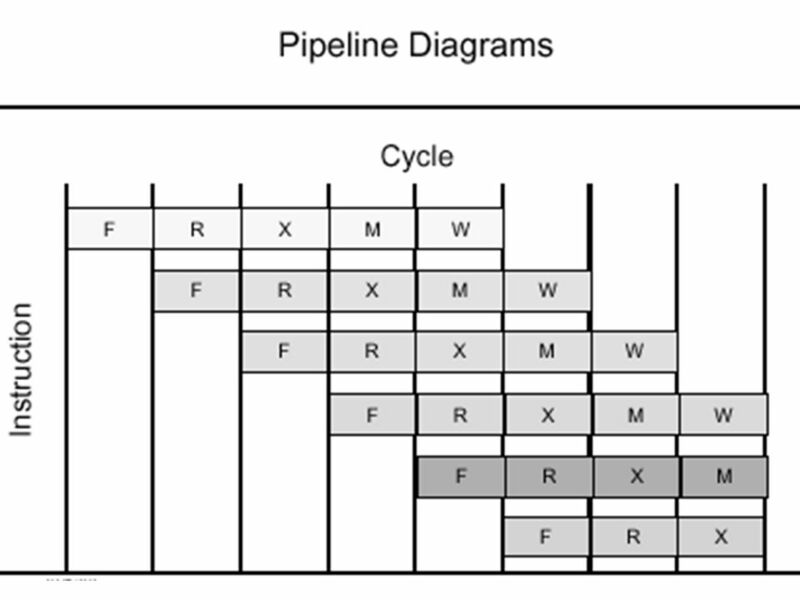 The flow of instructions through each pipeline is shown in the following Figure. 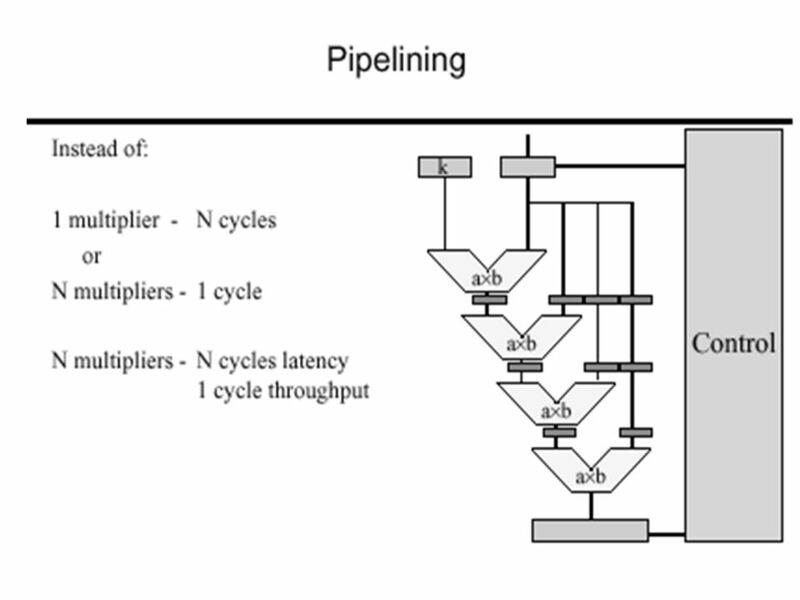 80 A Single Pipelined Control Unit Offers Several Advantage: The primary advantage is the reduced hardware requirements of the pipeline. 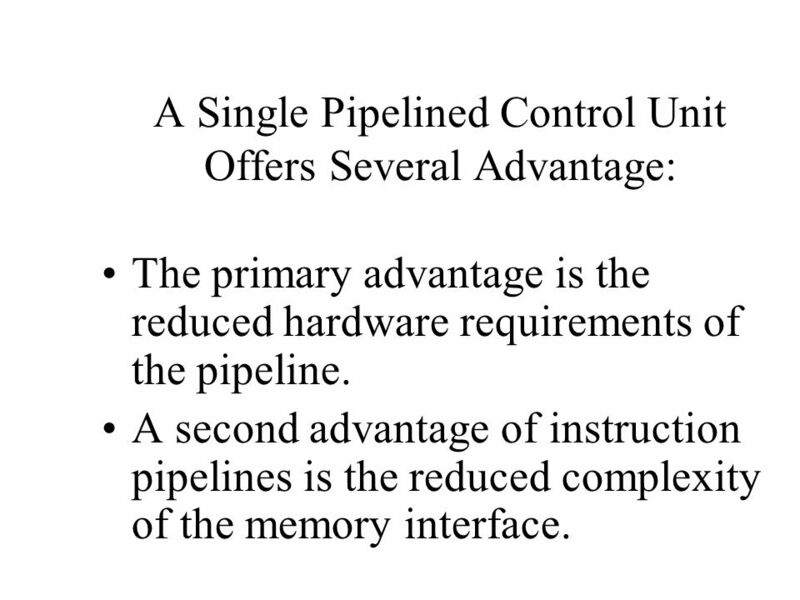 A second advantage of instruction pipelines is the reduced complexity of the memory interface. 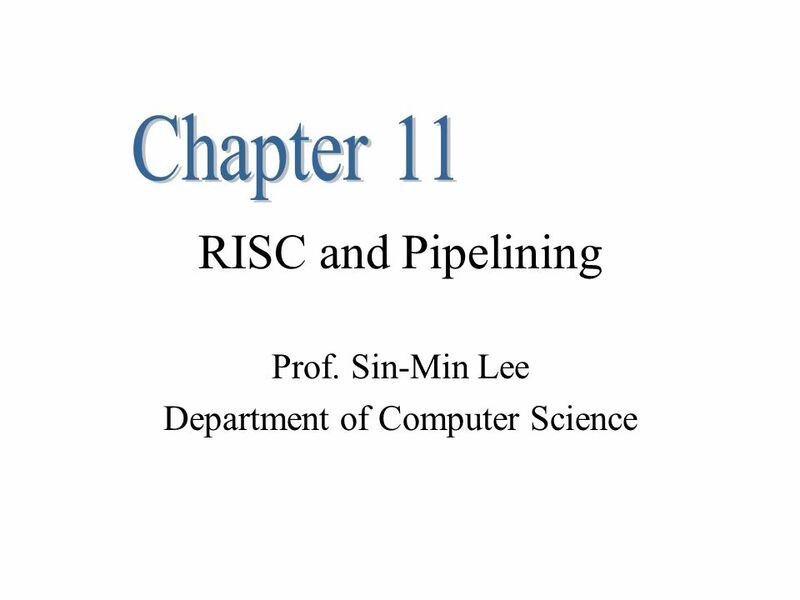 Download ppt "RISC and Pipelining Prof. Sin-Min Lee Department of Computer Science." 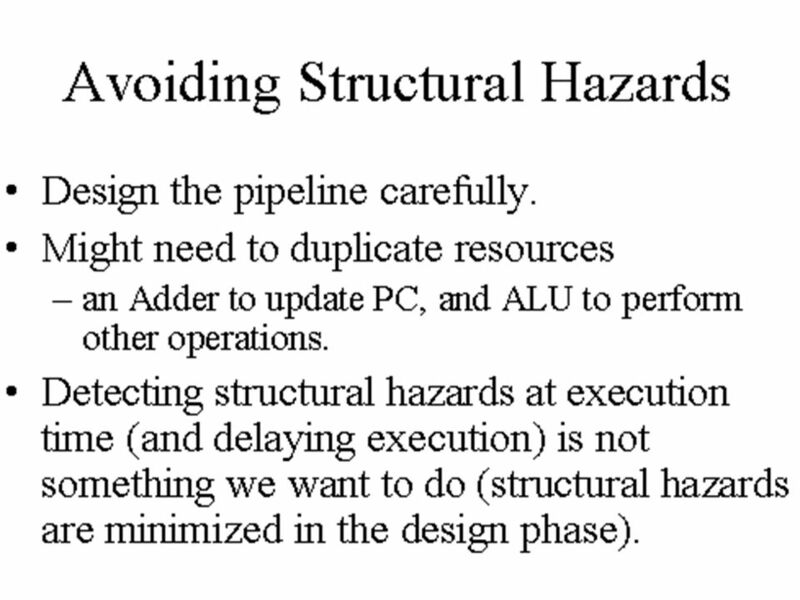 More Intel machine language and one more look at other architectures. 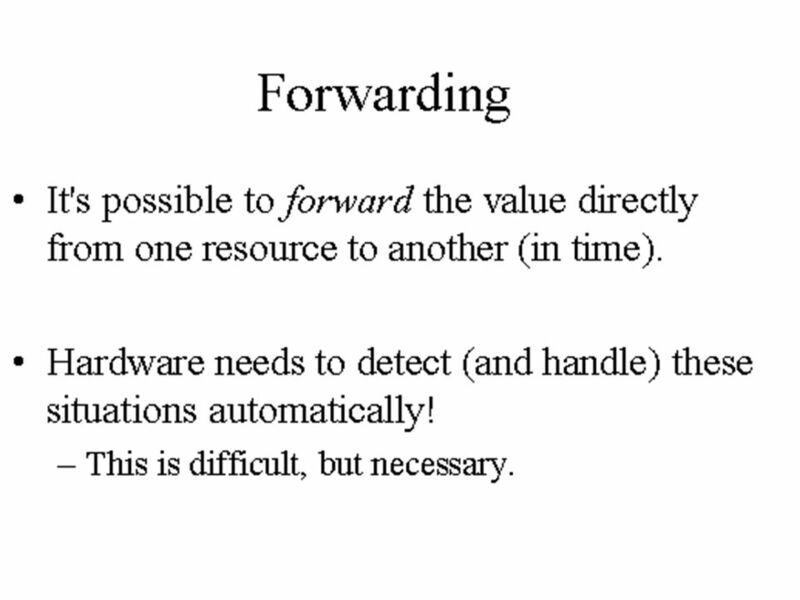 1/1/ / faculty of Electrical Engineering eindhoven university of technology Speeding it up Part 3: Out-Of-Order and SuperScalar execution dr.ir. A.C. Verschueren. 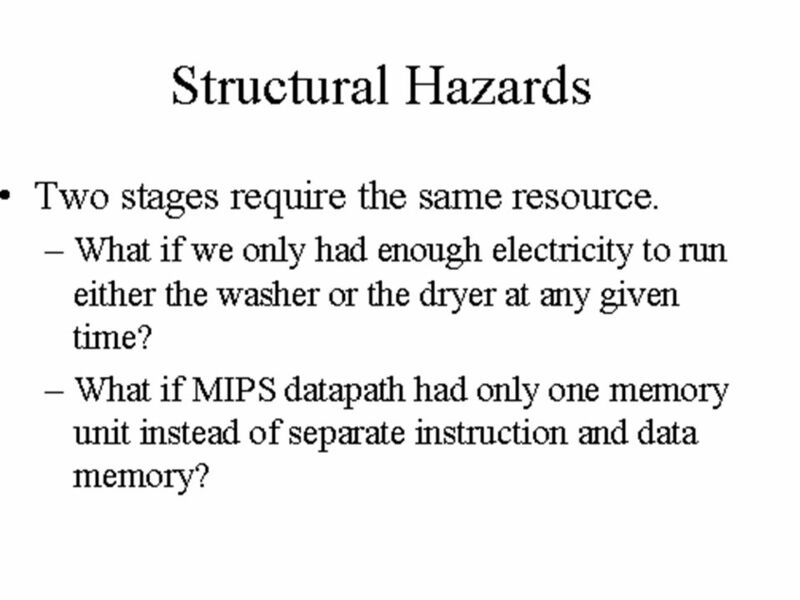 Superscalar processors Review. Dependence graph S1S2 Nodes: instructions Edges: ordered relations among the instructions Any ordering-based transformation. 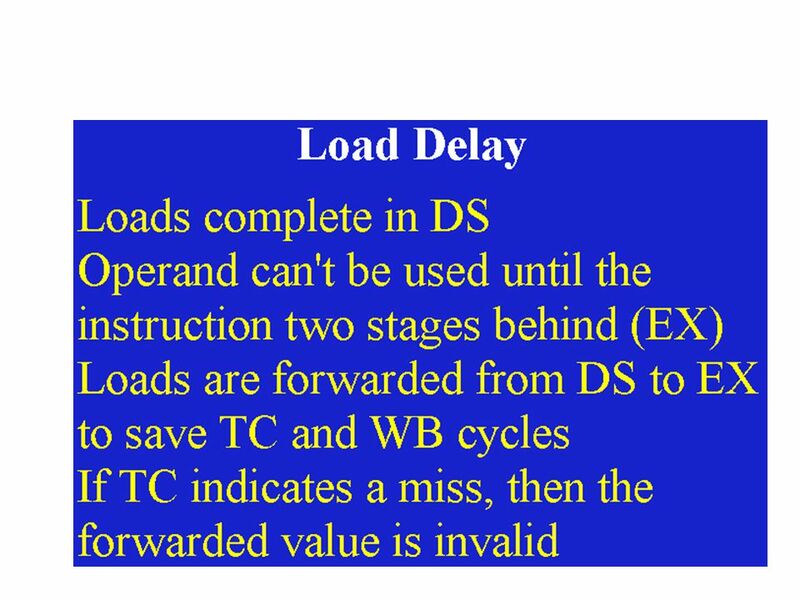 1 ITCS 3181 Logic and Computer Systems B. Wilkinson Slides9.ppt Modification date: March 30, 2015 Processor Design. 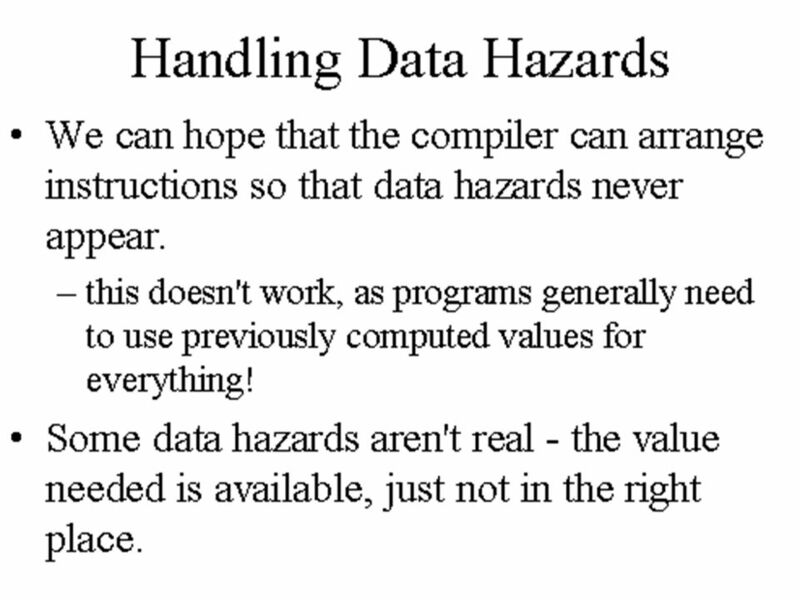 OMSE 510: Computing Foundations 4: The CPU! Lecture 2-Berkeley RISC Penghui Zhang Guanming Wang Hang Zhang. 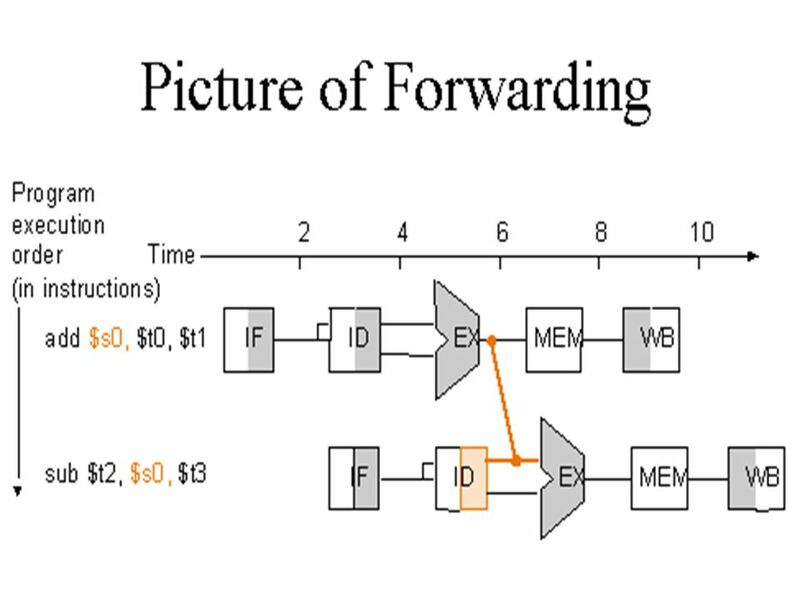 Computer Architecture and Data Manipulation Chapter 3. 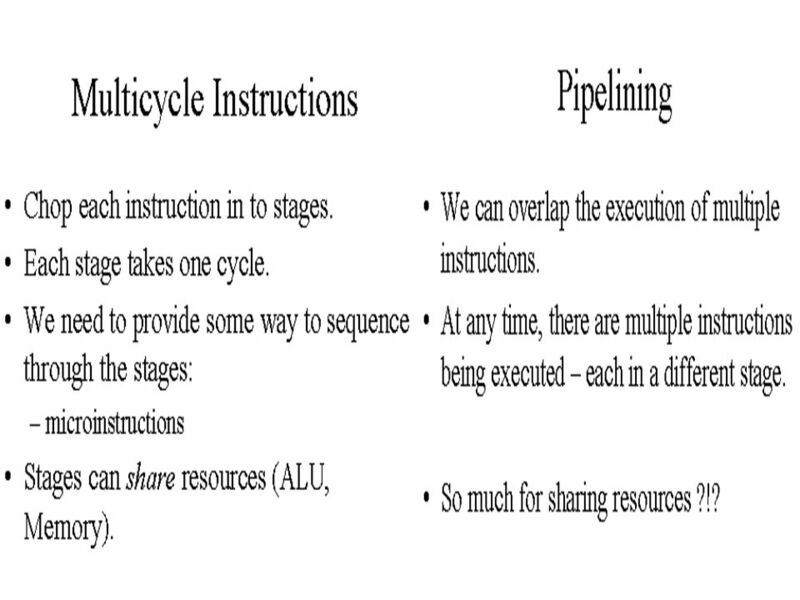 Instruction Level Parallelism (ILP) Colin Stevens. 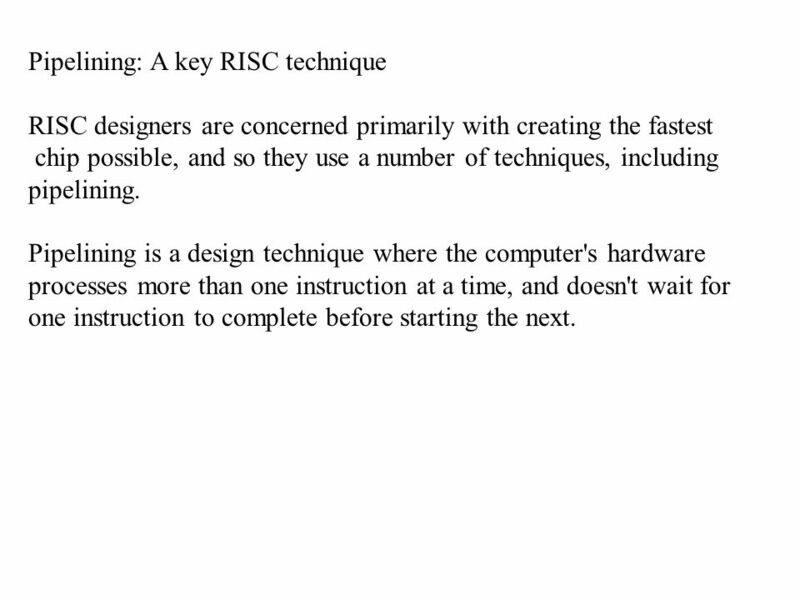 Chapter XI Reduced Instruction Set Computing (RISC) CS 147 Li-Chuan Fang. Computer Organization and Architecture The CPU Structure.